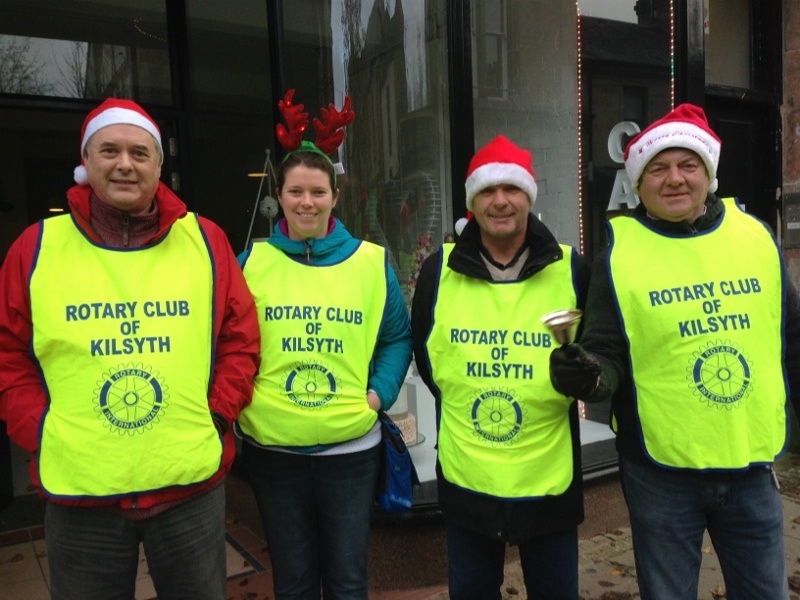 Rotary Club of Kilsyth - Welcome! A happy group having a great time. We meet weekly on a Thursday evening, enjoying a meal and fellowship. Meetings can include interesting speakers, entertainment or business. We work with the local community, assisting youth, elderly and other community groups. 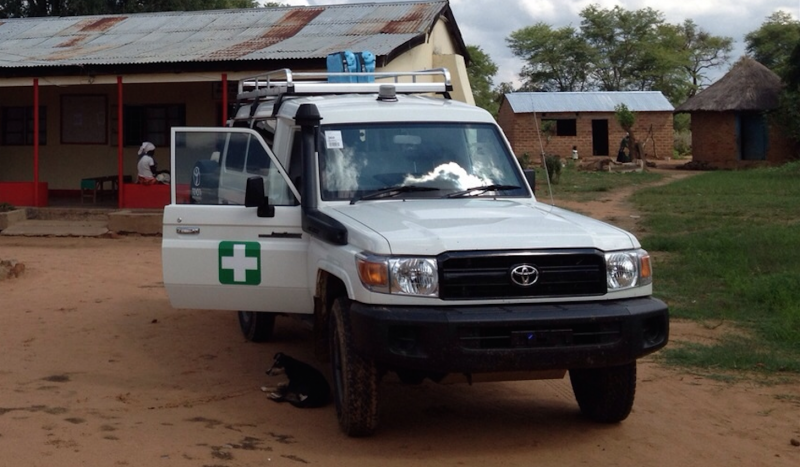 We raise and distribute funds to charities and projects both at home and abroad. 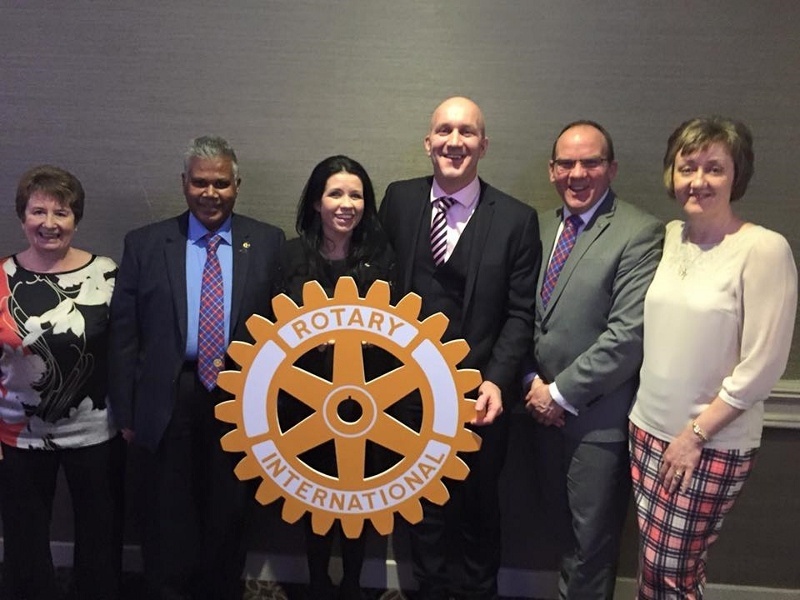 Rotary is the world's leading service club organisation working on a local, regional and international level. 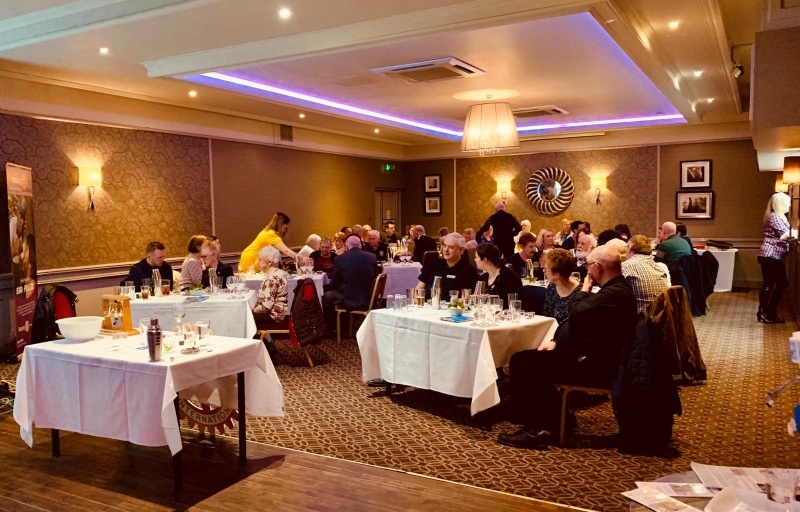 Kilsyth rotarians dedicate themselves to the Rotary motto and philosophy "service above self"
We held a special event for members, guests and potential members where we learned about the art of cocktail making and, of course, sampling. 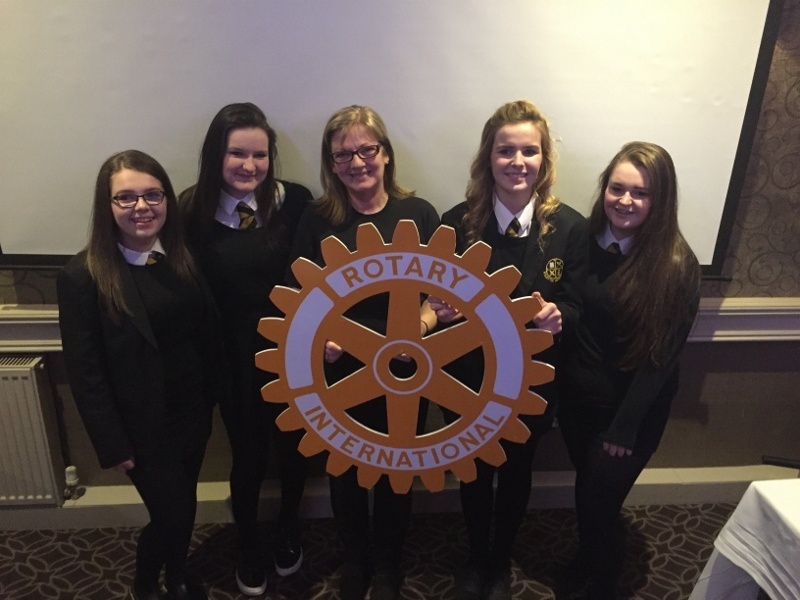 Thanks to 2nd Kilsyth Girls Brigade who raised money to fund a Literacy in a Box (a Rotary Charity) in Zambia. Once again we hosted the district Technology competition. 27 teams from schools across Lanarkshire took part. 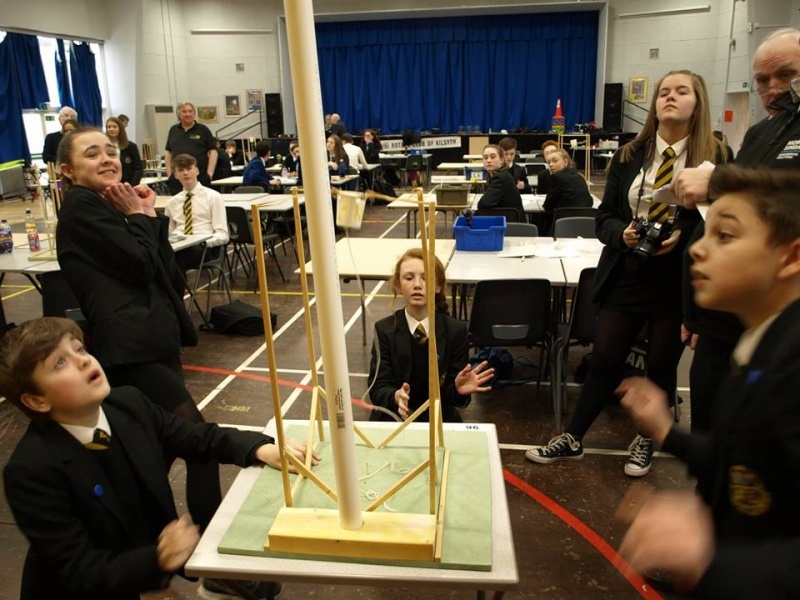 Winning teams came from Dalziel HS, Greenfaulds HS and Kilsyth Academy. Our annual show of crocuses is approaching. We have planted crocuses in the town for a number of years as port of Rotary's commitment to eradicating the scourge of polio. Nearly there!!! In collaboration with Cumbernauld club, we raised money for British Heart Foundation with our Valentine's tree in the Antonine Centre. Sophie and Emily Murphy spoke to us about their experience on Challenge Enterprise which we sponsored. 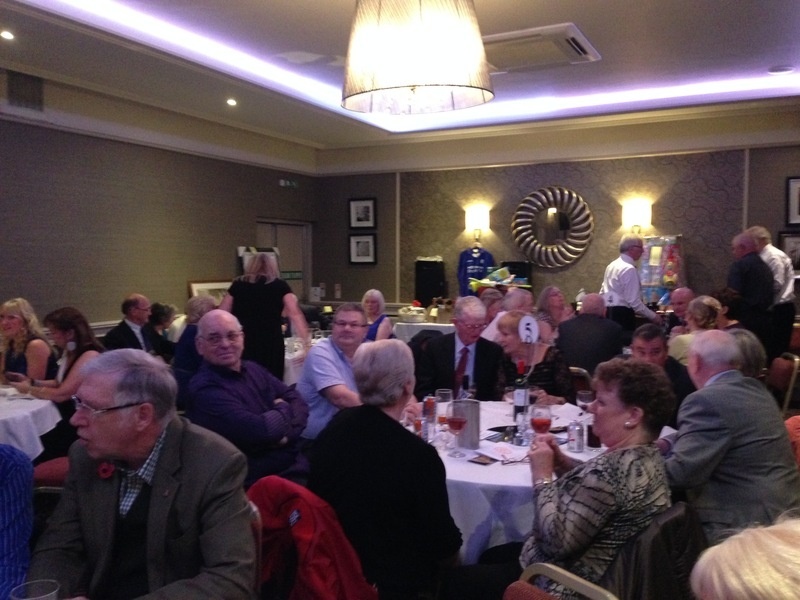 William Houston gave an account of his week on RYLA sponsored by Cumbernauld club. 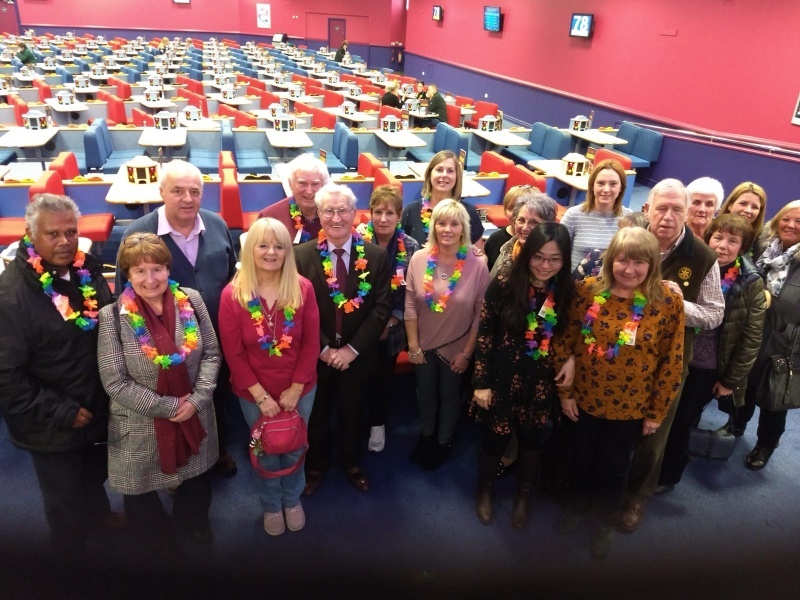 Rotarians and friends from Kilsyth and Cumbernauld clubs were guests of Buzz Bingo in Cumbernauld who supported Aquabox charity. Member Claire Walters with Fiona Taylor, Foundation Apprenticeship Coordinator, GKC. Claire gave an inspiring talk about her visit to India and the college's partnership with UKEIRI and projects that empower disadvantaged groups. A great turnout once again for our annual carol service. Thanks to everyone who attended and gave support. 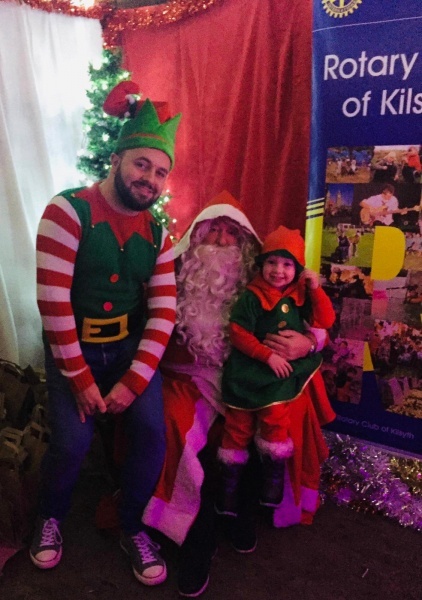 Santa's Grotto was a huge success at the Port Gallery at Auchinstarry. We donated two portable televisions for patients at the local Cottage Hospital. Some members sported their Christmas jumpers at our Festive meal event. Lovely Christmas meal at the Coachman once again. 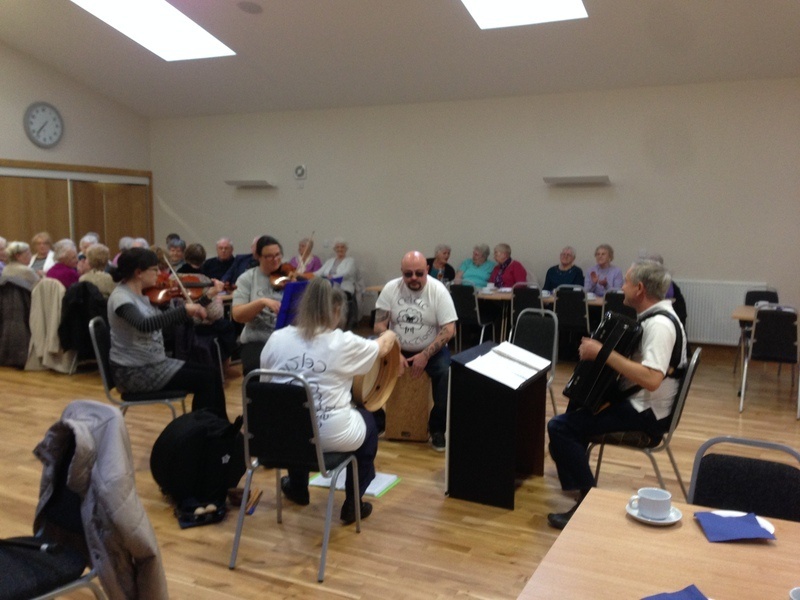 We supported local group Connections based at the Garrell Vale. 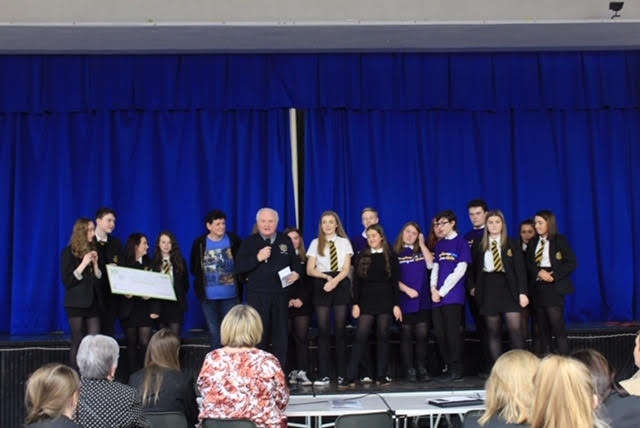 Member Frank Clark helped with the judging at this annual Charity focussed competition at Kilsyth Academy. 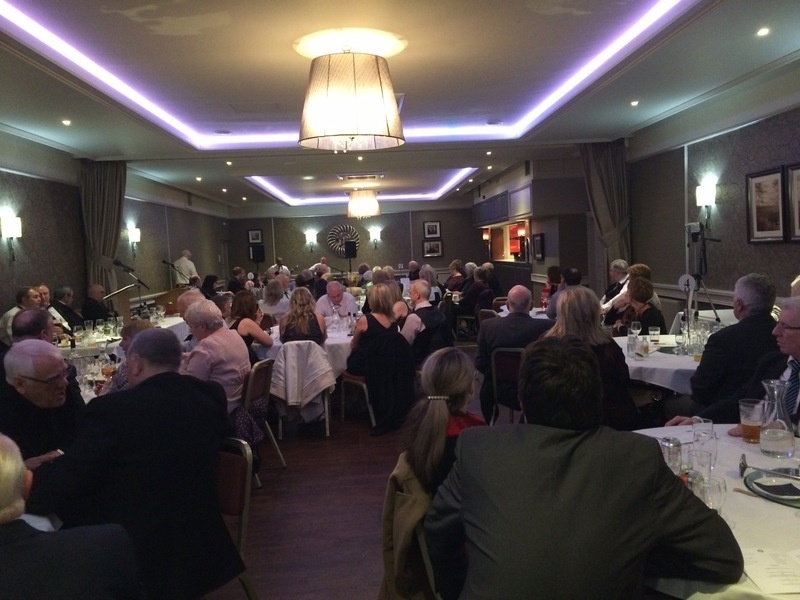 Our annual Charity Dinner was a great success and enjoyed by all who attended. Over £4000 was raised. Thanks to all who supported the event. We've been planting trees in the local community with the help of local scouts' group. Planted over 100 this year. More next year. President Elect David Breton attended this year's RI Convention in Toronto in June. He gave an interesting presentation to the club about his experience. Kilsyth Primary School quiz team and parents at the final at Carluke Lifestyles Centre looking pleased with and proud of their achievement. Past President Dave Stewart with the young footballers of Kilsyth Community Club which received a donation from us. 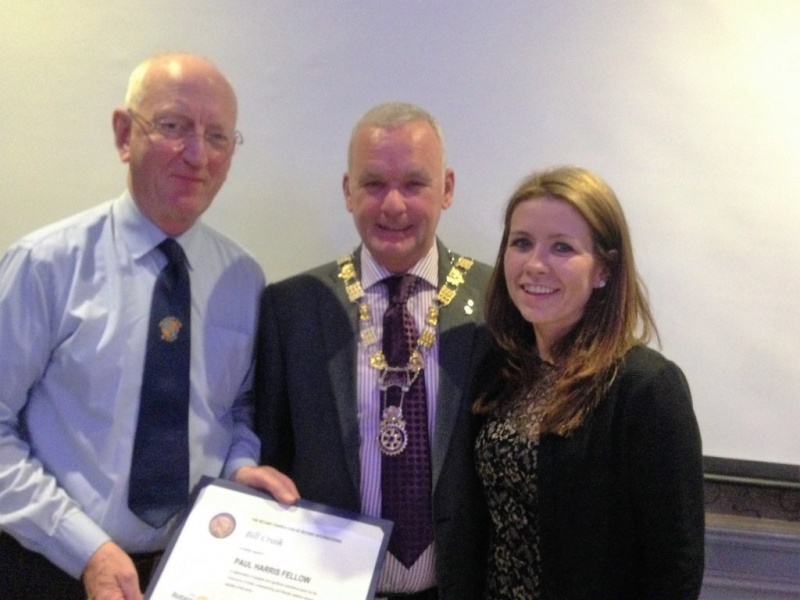 President John passed the chain to incoming President Lorna. Before that, he presented Dave Stewart with a Paul Harris Fellowship Award. We were then entertained by Willow Moon with a selection of easy-listening folk, traditional, country and American music. Ready for the off. 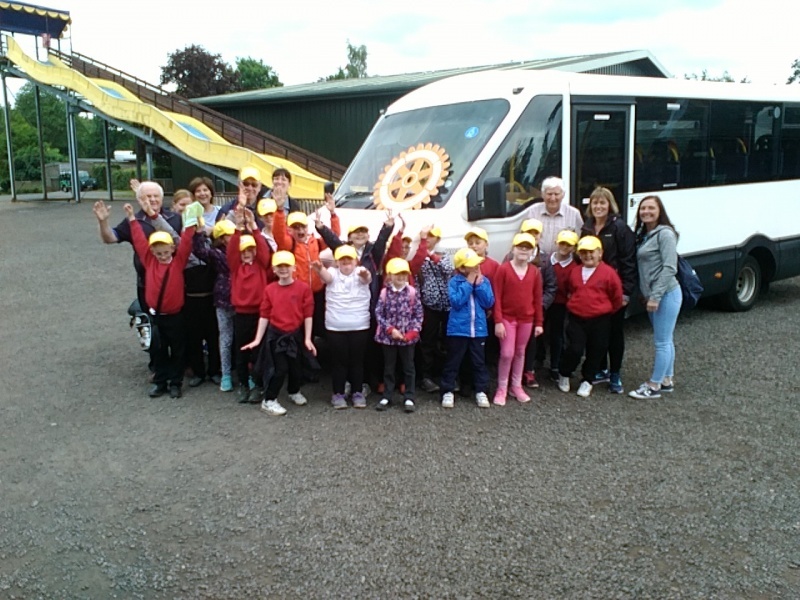 A group of pupils from Glencryan School with teachers, helpers and Rotarians had a great time at the Safari Park. A memorable day for all concerned. Congratulations to the team representing Saskys who won this year's competition. The event raised over £2000 for charities. 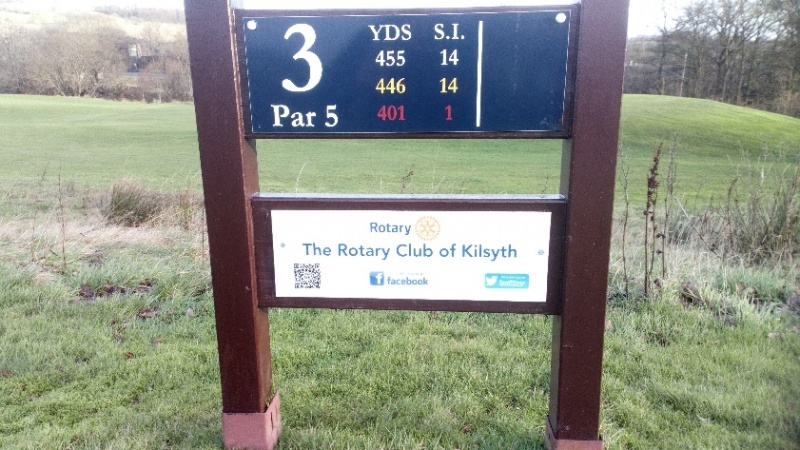 Our thanks go to Kilsyth Golf Club, sponsors and all who participated in and supported this great event. 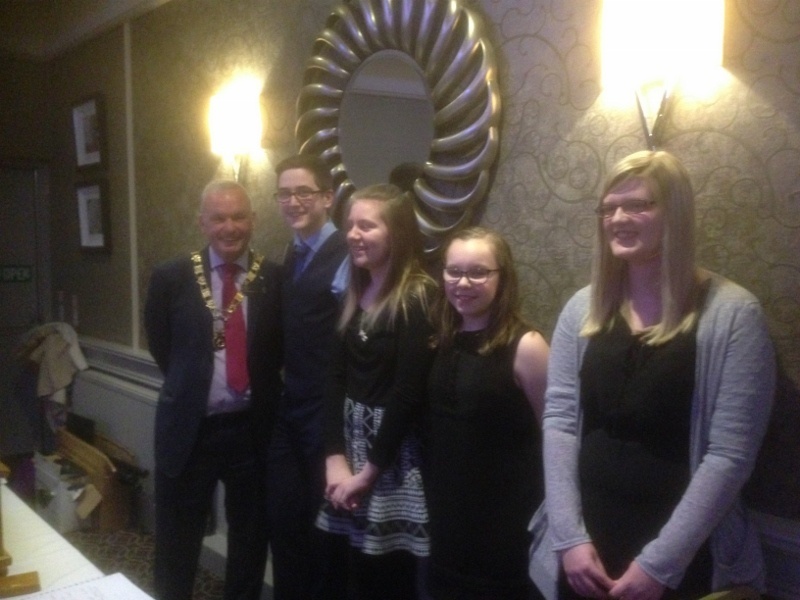 President John with the Kilsyth Primary Quiz team which won the west zone semi-final. 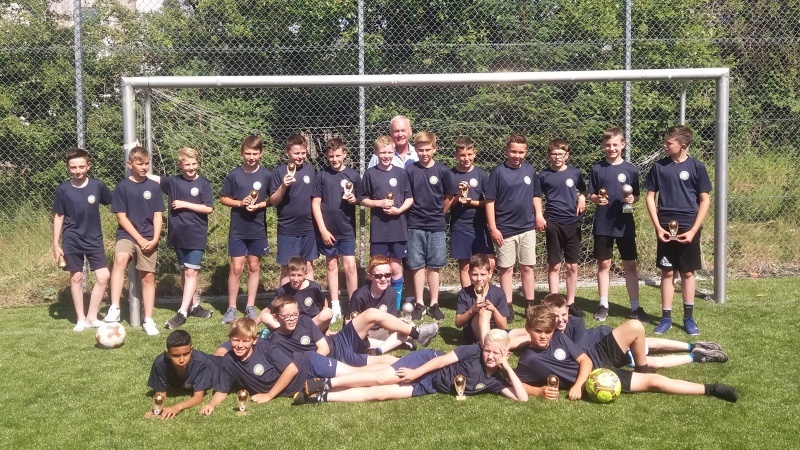 They competed admirably in the District final on June 2. 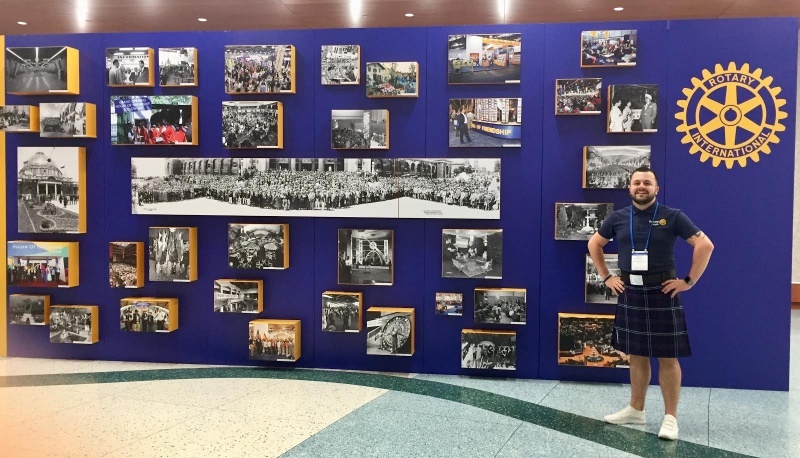 Club member Victoria Truesdale gave an excellent account of her trip to the Gold Coast Games and her experience as technical official and judge in the hockey tournaments. Christine Johnstone with Craig and Cameron gave an interesting talk on the work done to renovate a village school in Malawi in 2016. 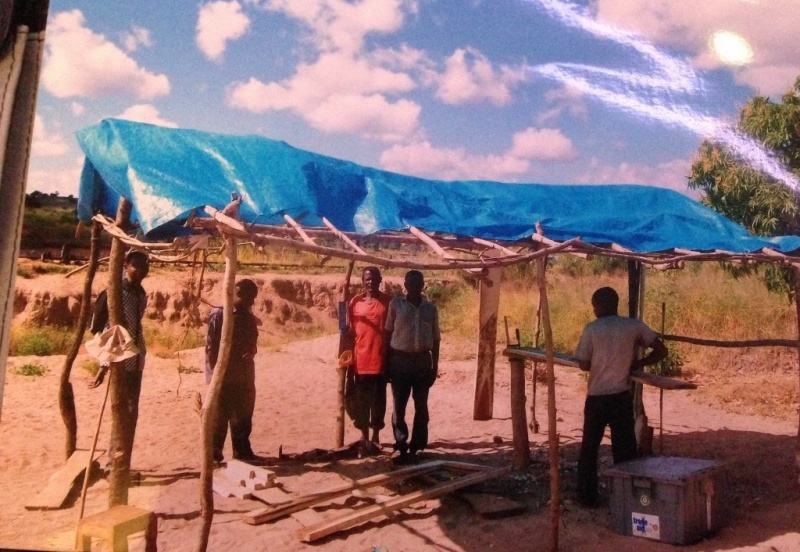 A return visit is planned in June this year to upgrade another 2 school classrooms. 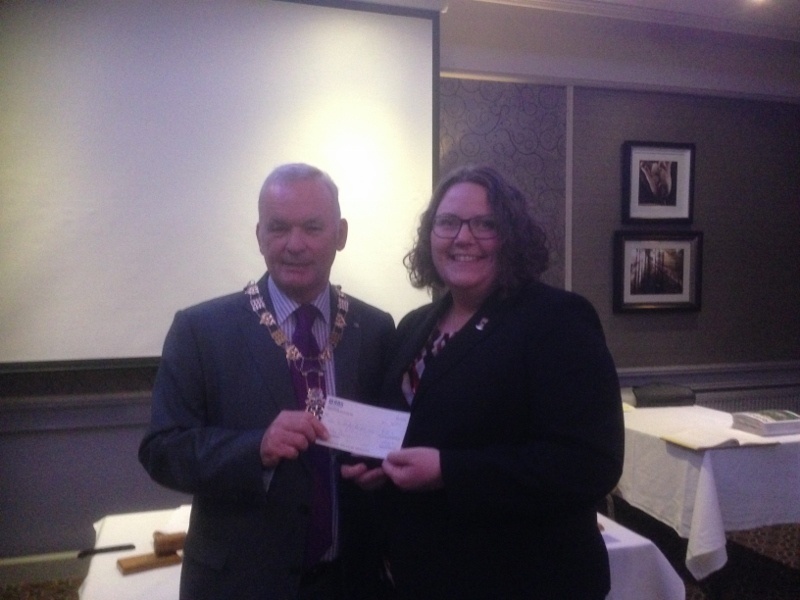 President-Elect Lorna presented a cheque to help with the work. 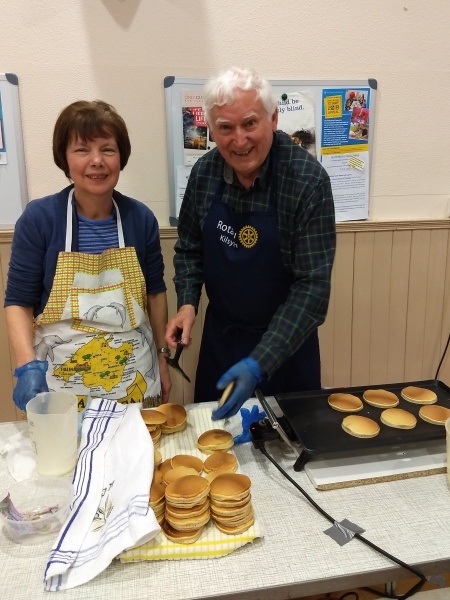 President John dons his Rotary apron and with Margaret helps raise funds for the June trip to Malawi by local BB group. Our annual Senior Citizens Concert was held in the Anderson Church. A big audience appreciated the wonderful entertainment provided by Campsie Accordion band. We gave a cheque to 2 locals scouts who are fundraising to take part in the World Jamboree in West Virginia in 2019. They gave a delightful and informative presentation. Well done! Congratulations to Kilsyth Primary Schools, winners of our heat of the District Primary Schools Quiz. Thanks to all pupils and schools that took part. For a number of years we've planted crocuses to highlight Rotary's on-going campaign to end polio worldwide. Having survived the winter, they're about to bloom. 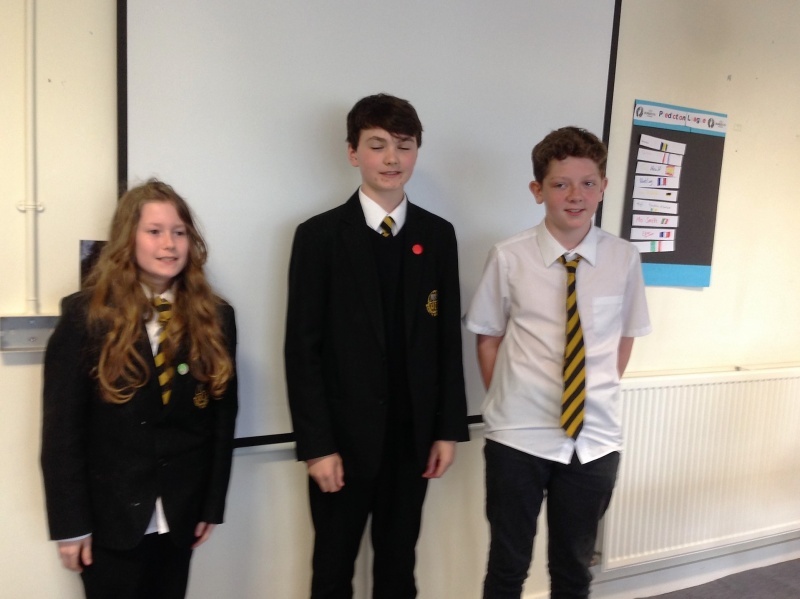 The Public Speaking Competition took place recently at Kilsyth Academy. President John and President-Elect Lorna posed with the winners. 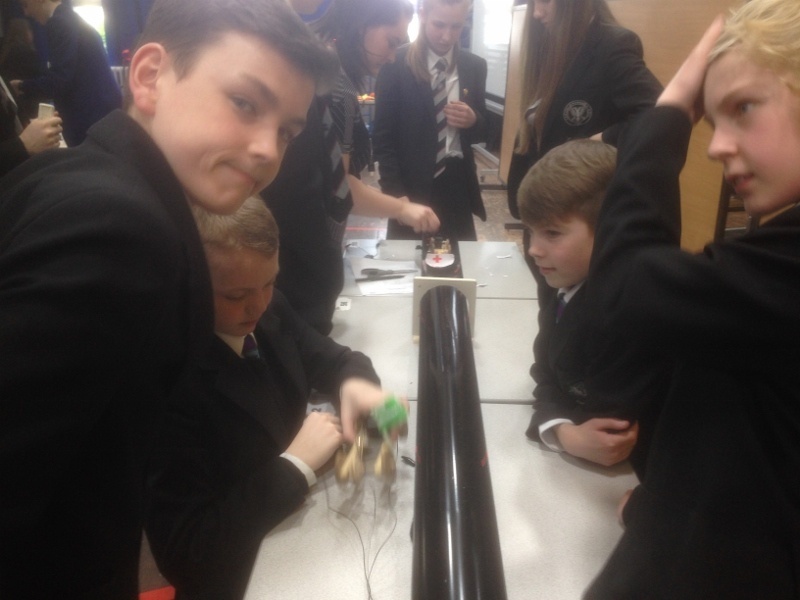 The club once again hosted the west area District Young Technology Competition at Kilsyth Academy. Members of the group study exchange to Ohio gave an interesting talk about their experiences. 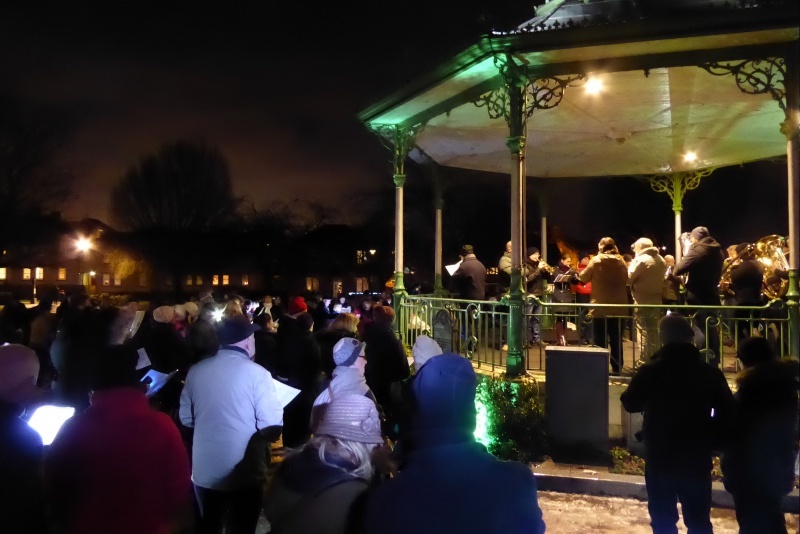 Our annual carol singing event took place once again. 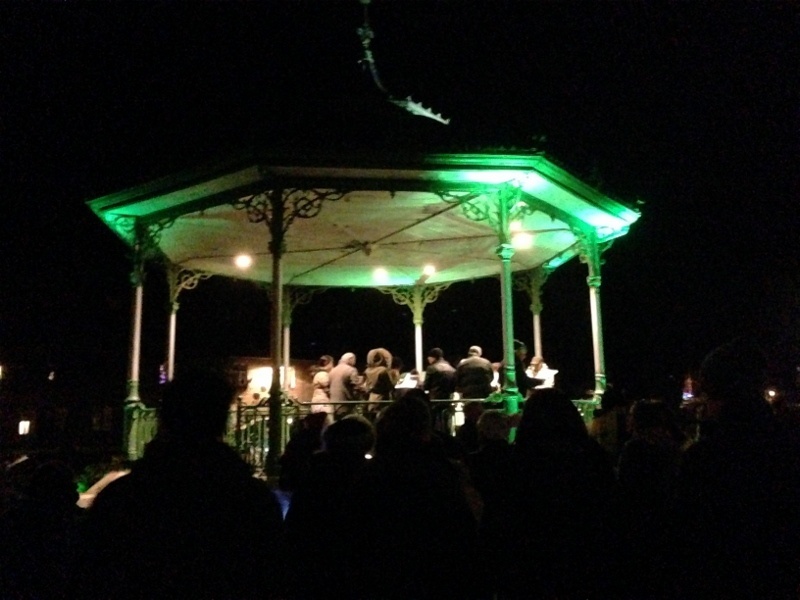 Thanks to all who turned out to support it and, of course, Croy Silver Band, Andy Muldoon and Alex Graham for catering. We had a very enjoyable Christmas meal (thanks once again to the Coachman Hotel). Afterwards we formally welcomed new Honorary member Charles Coulthard and enjoyed a wonderful slide presentation of photos set to music by Andy Pearson. 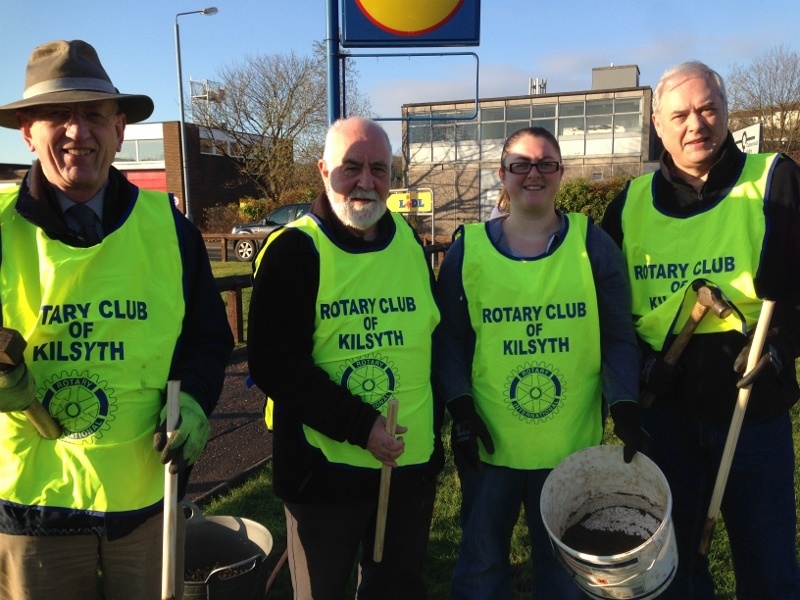 Rotarians and helpers, including members of the 3rd Kilsyth Rainbow Guides were out in force to plant more crocus bulbs to mark Rotary's continuing commitment to end polio across the world. We're nearly there. Look out for a splash of purple in the new year. Gail Macdonald gave an interesting talk on the on-going support given to youngsters from Ukraine whose lives have been affected by events at Chernobyl some 30 years ago. Julia Lewsley hosted Olga Kostiuchenko who acted as organiser / translator for a party of around 12 youngsters from Ukraine who were hosted by families in the area. Another lovely presentation from the kitchen staff. This starter is wrapped chicken stuffed with Italian herbs & vegetables served on a veg puree. Margaret Brown and Shirley Black from the Cottage Hospital thanked us for our donation which paid for lighting and hanging baskets in the garden restoration. Much appreciated by patients, staff and visitors. DG Lindsay Craig visited us and spoke on a number of Rotary matters. We have a new member. Welcome to Dot Clelland. We're grateful to the Coachman Hotel for the quality of our weekly meals. This starter is a work of art. 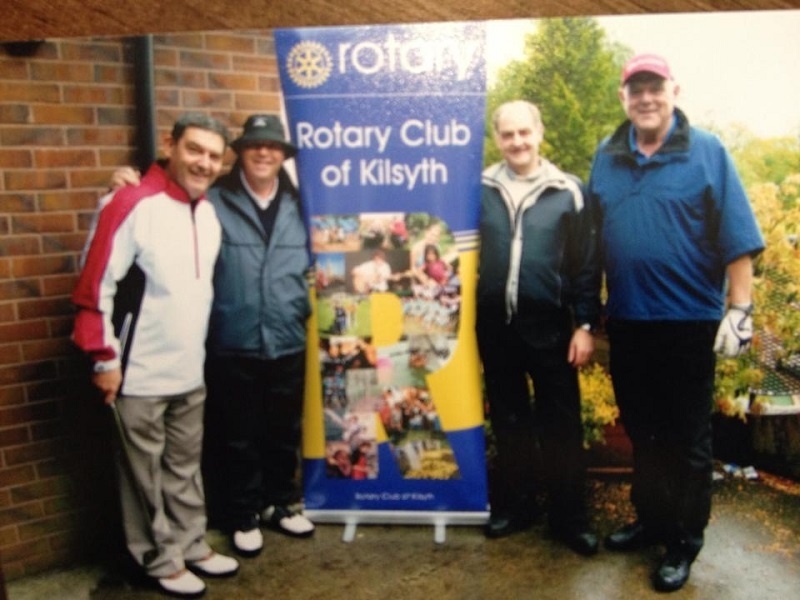 We recently held our annual golf competition at Kilsyth Golf Club. 48 competitors took part and the standard was excellent. This year's changed format proved to be successful. Congratulations to the winners Cross Butchers. We expect to have raised over £2000. Thanks to all who supported it. 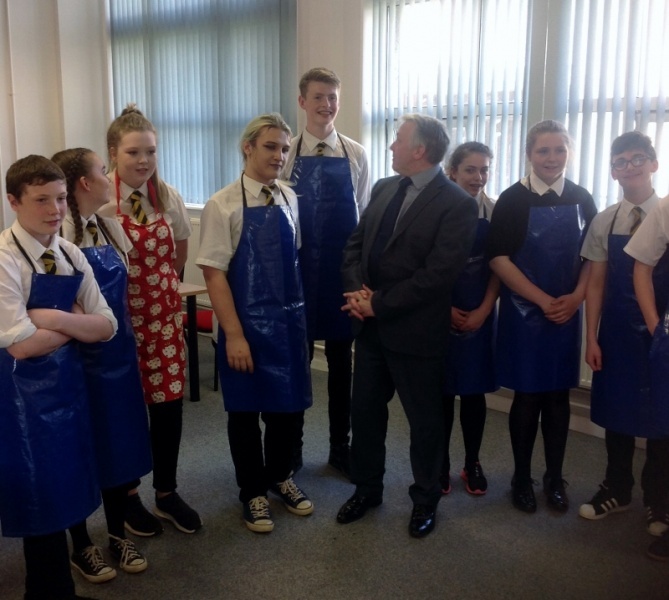 Stephen Giles with some of the competitors in this year's bake-off competition. Winners were Ewan Abercrombie and Rory MacKenzie. Thanks go to judges John Fleming and Agnes Wilson. 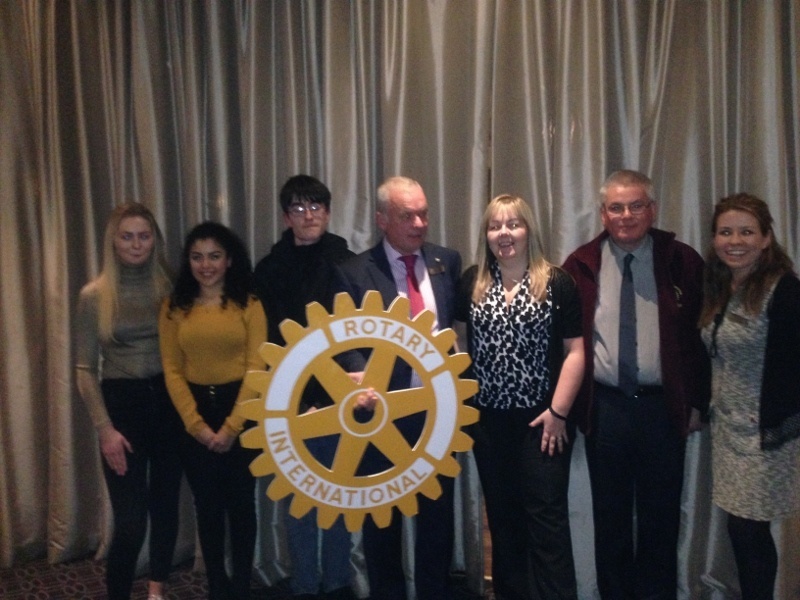 The winning team from this year's competition at Kilsyth Academy gave an interesting presentation to the club about their chosen charity, Full Circle Foundation. A Glasgow-based charity, it provides music therapy to people with cerbral palsy. Their efforts were rewarded with a cheque for £3k for the charity with a further £200 from Kilsyth club. We heard about and gave a donation to the Sweet Project and Teen Challenge. Monies raised help to provide a bus which visits local communities and offers support to people with drug addiction issues and encourages rehabilitation. 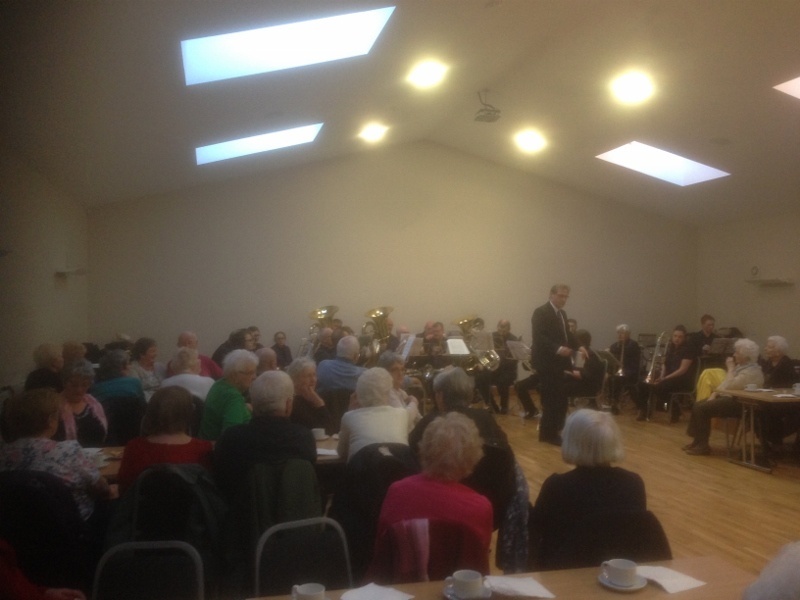 Croy Silver Band provided the much enjoyed entertainment at the annual Senior Citizens' Concert. 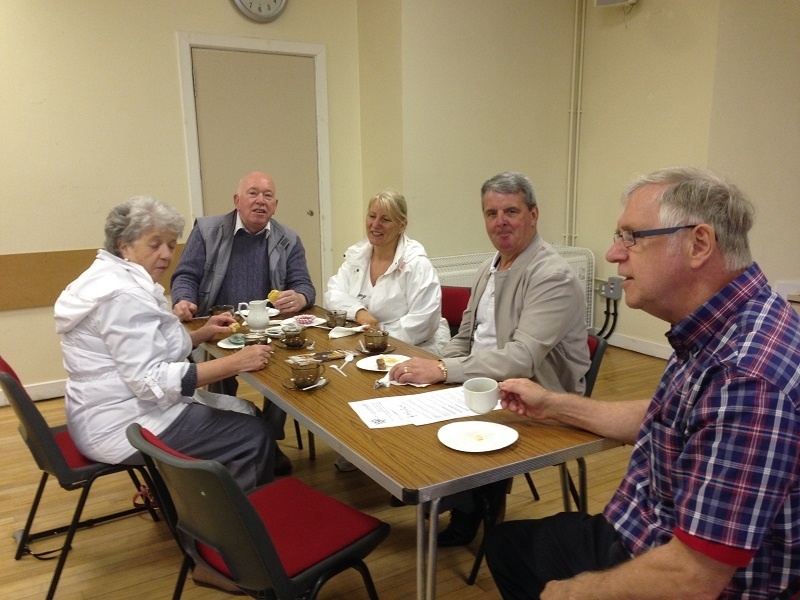 Tea, coffee and cakes were served to the appreciative audience. 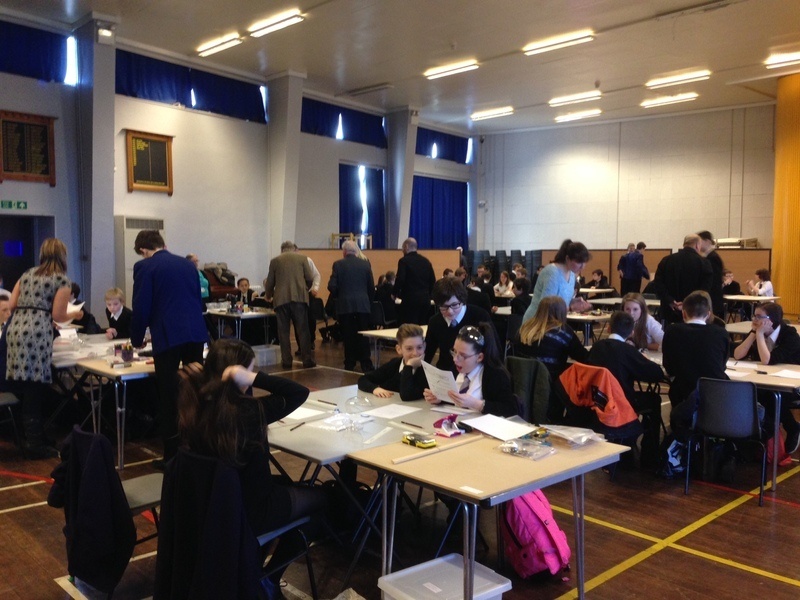 Kilsyth club once again hosted the West Area Young Technologist Competition with schools coming from far and wide. Here some youngsters put their design to the test. 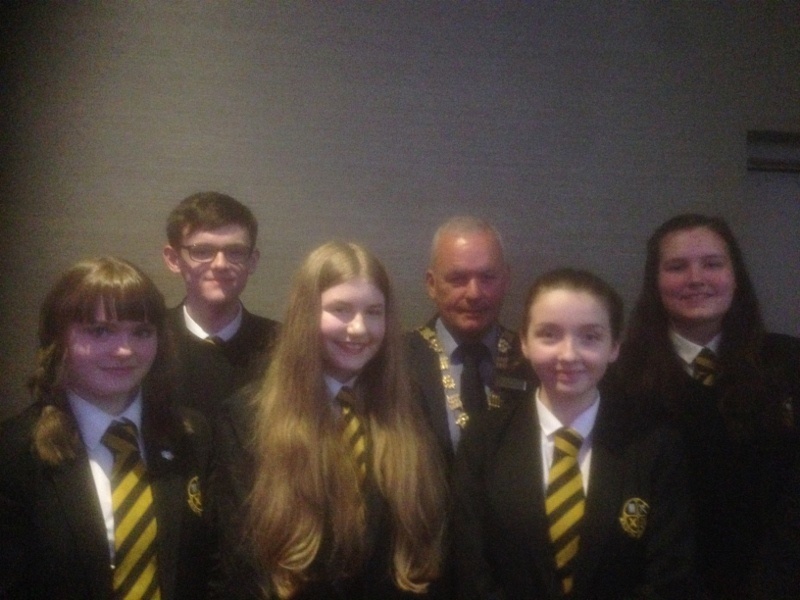 Winners and runners-up in the Public Speaking Competititon at Kilsyth Academy were invited to the club. Members were delighted to hear their speeches. 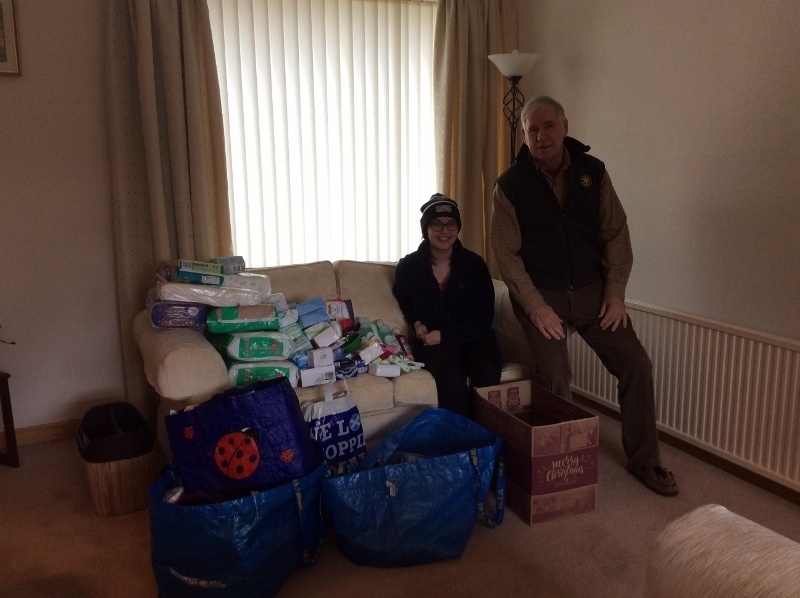 Following a recent talk to the club about the work of Dresses for Gambia Charity by Rhiann Middleton, the club collected a variety if items which soon will be on its way to Gambia. Heather McVey spoke enthusiastically about the Transplant Games to be held in North Lanarkshire in July. We then took part in a Slosh before presenting a cheque for the Games. 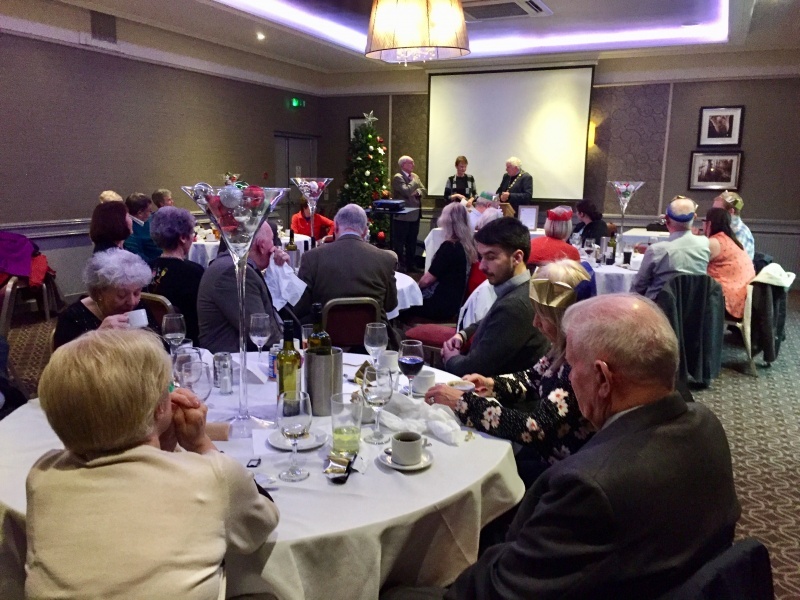 Club members, family and friends enjoyed a memorable Christmas night. Excellent meal provided by the Coachman was followed by entertainment by Mike Munro ( Neil Diamond tribute). Great fun. Another good turnout for the annual carol service. Thanks to Croy band and to Alex Graham who provided soup and rolls. 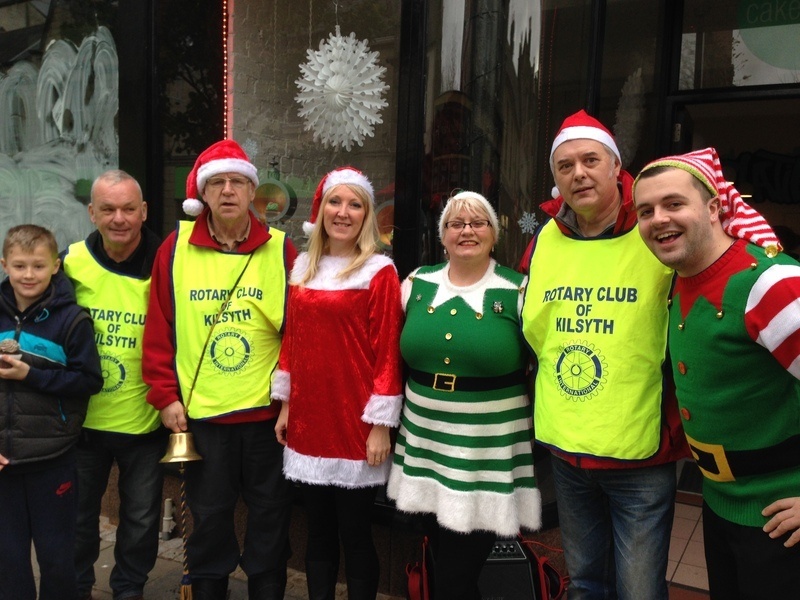 Santa's helpers were out in force to help Santa in the Main Street who handed out sweets to young children. Thanks to Cakelatier for their assistance and support. Some members helped to plant crocus corms near the town centre. Purple crocus is the symbol for Rotary's worldwide Purple4Polio campaign. Students from Kilsyth Academy and St Maurice's HS spoke to the club about their successful weekend at Challenge Enterprise. 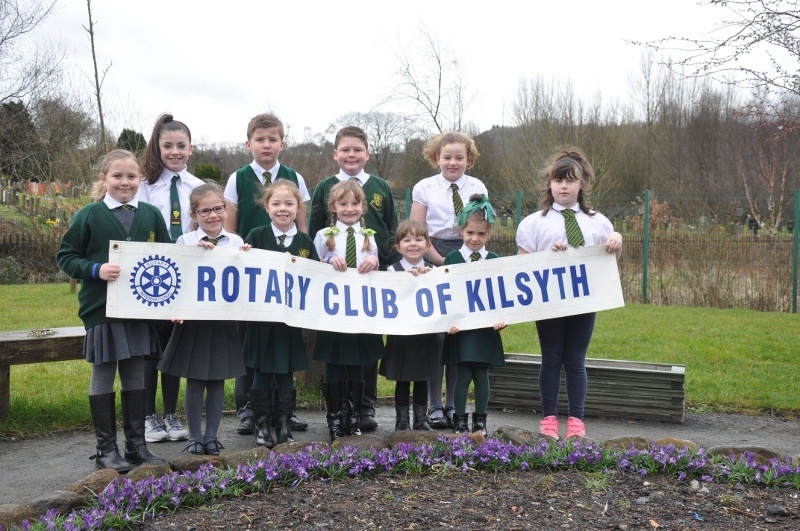 District organisers thanked Kilsyth club for their support. 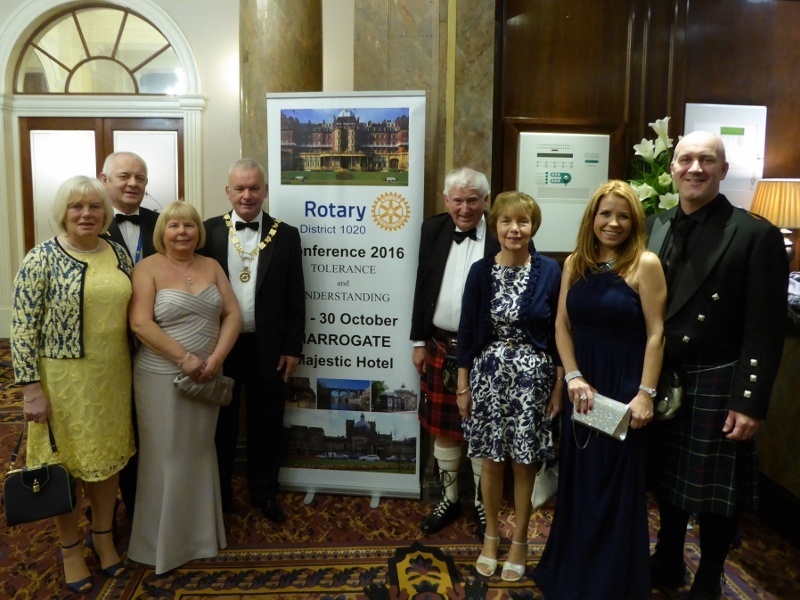 Some members and partners attended the District Conference in Harrogate. A great time was enjoyed by all. 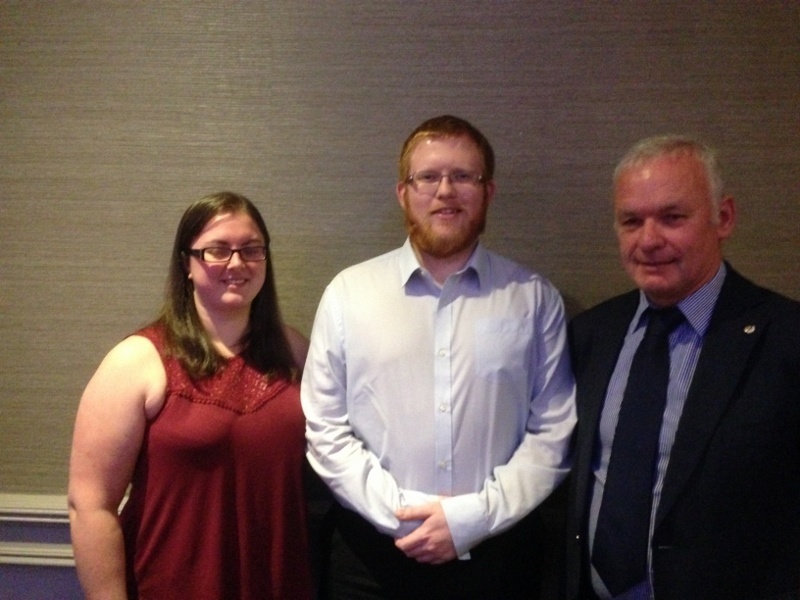 President Dave welcomes new members Heather and John. 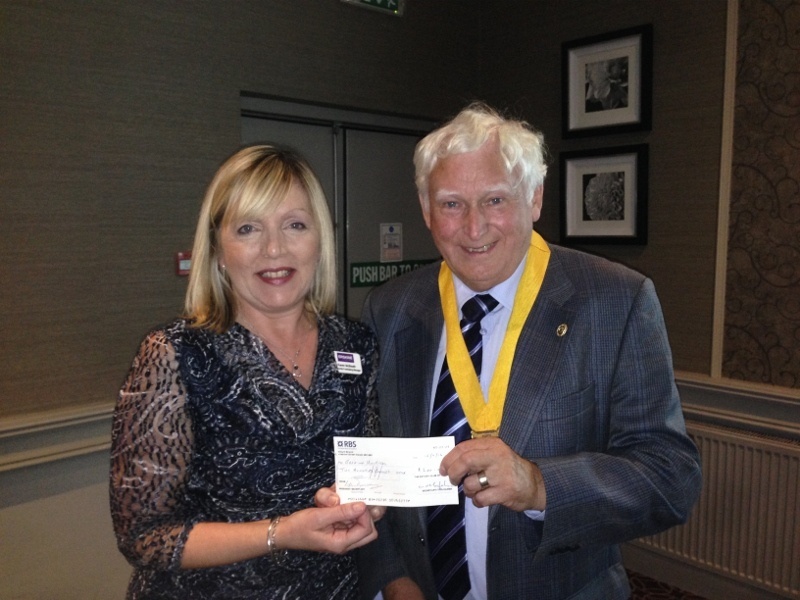 Karen MacBeath receives a cheque from SVP John Brown as a donation to Erskine. Karen gave a detailed and interesting talk on the important work of this charity which supports ex-service personnel and their families. 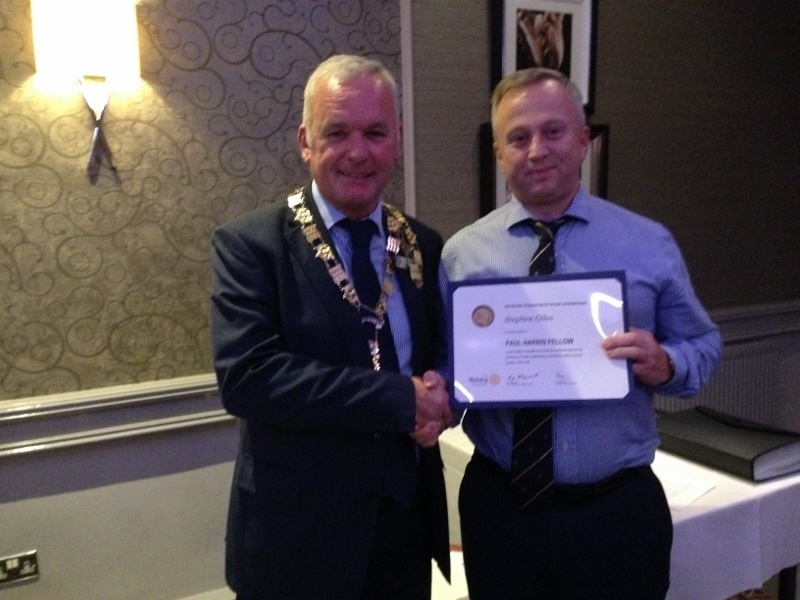 Stephen Giles receives a Paul Harris Fellowship Award from President Dave Stewart. 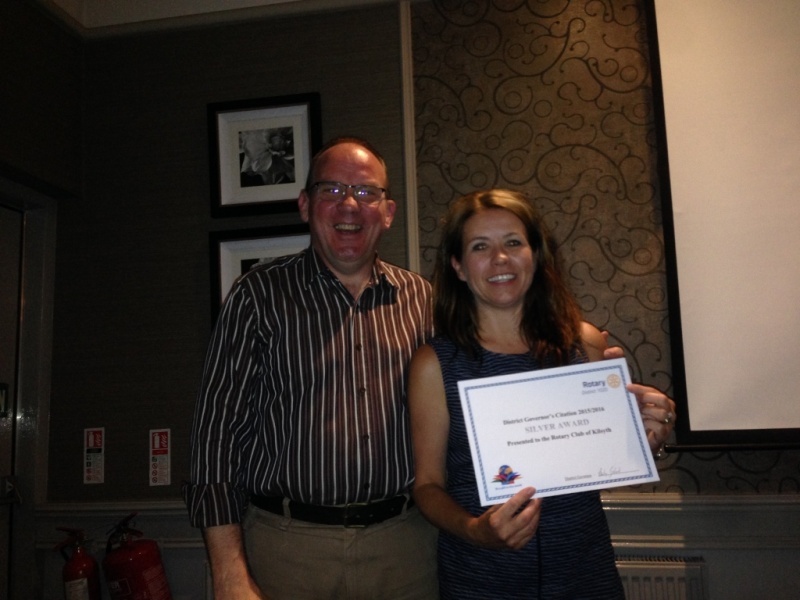 Past President Claire gratefully accepts a certificate from Past DG Andy - a silver award DG Citation for club achievements during 2015-16. We ended the year and started the new one on a high with an excellent night at the Coachman. Past President Claire handed over to President Dave and Bill Craik became our latest member to receive a Paul Harris Fellowship. 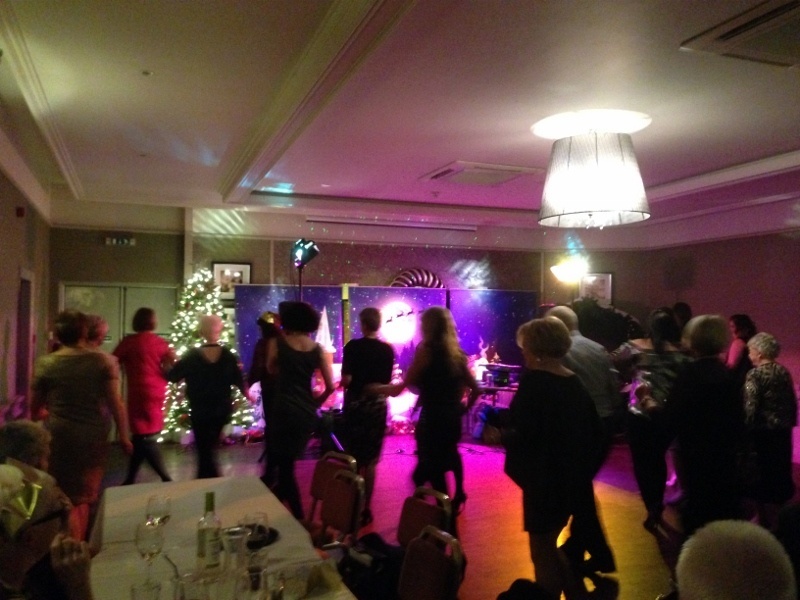 Great entertainment from Mike Munro (Neil Diamond tribute) and lots of dancing on the floor. The winners of the annual Public Speaking Competition at Kilsyth Academy held recently. 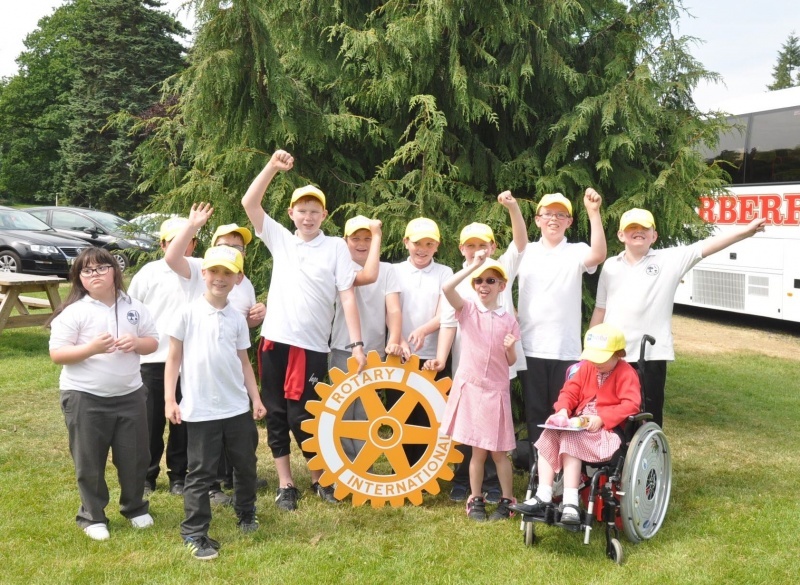 A group of 17 youngsters from Glencryan School, staff and Rotarian supporters had a great time at the Safari Park. 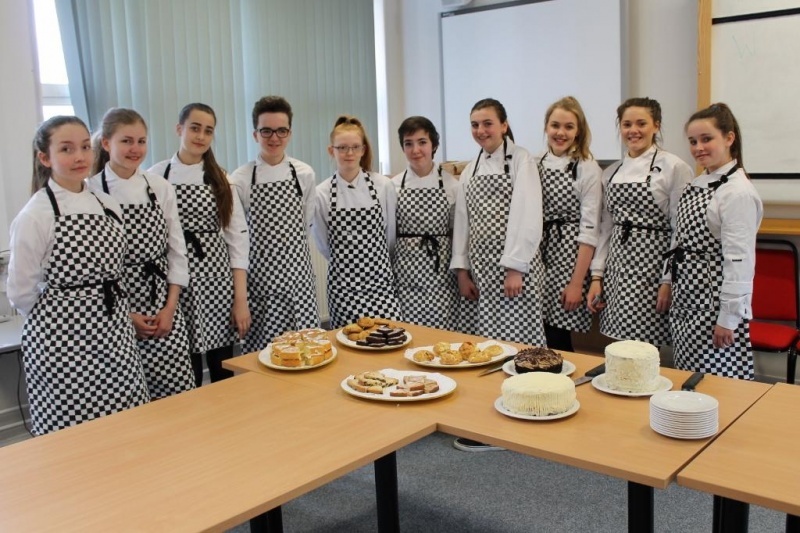 Kilsyth Academy pupils who took part in a Bake-Off Competition which we supported. 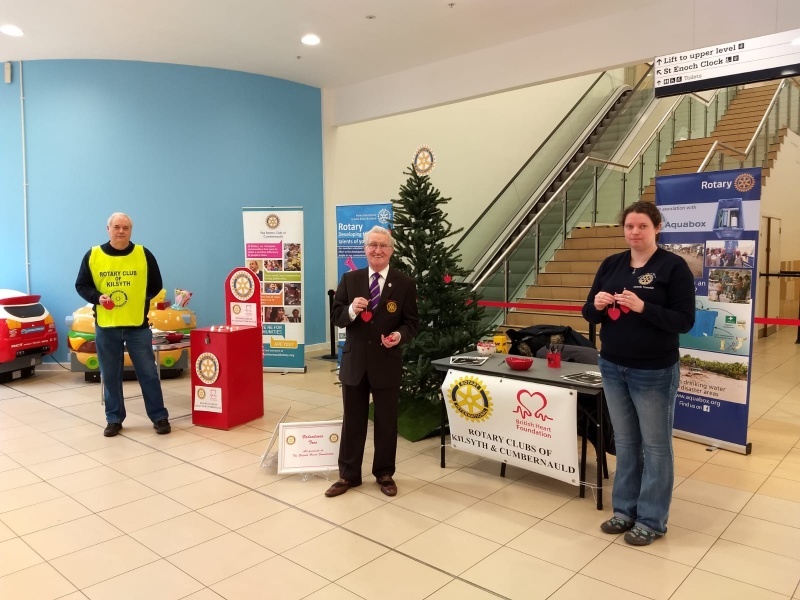 Last year we had a presentation from John Asher of Trade Aid, a Rotary club charity which provides boxes of tools for trained people in a number of third world countries. Our donation of Â£425 paid for a carpenter's box of tools for Chifinda Maluwa who can now work as a tradesman in his local area in Somaliland, a breakaway semi-desert territory on the coast of the Gulf of Aden. Dr Venter is a South African plastic and reconstructuve surgeon who has dedicated his life in recent years to provide free surgeries for Mercy Ships. He gave a most interesting talk at the club about his work with Mercy Ships. He was undertaking a fundraising cycling tour in the UK, having last year cycled across the USA. Miranda accompanied Tertius on the UK cycle tour and was tour organiser. 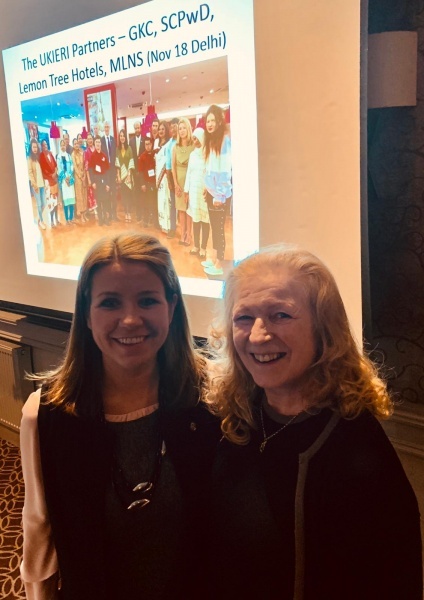 The club enjoyed a most interesting talk from orthoptist Janice Waterson about the charity work of Sight Aid International which works to provide and develop eye screening facilities in the poorest areas of Kenya and Malawi. 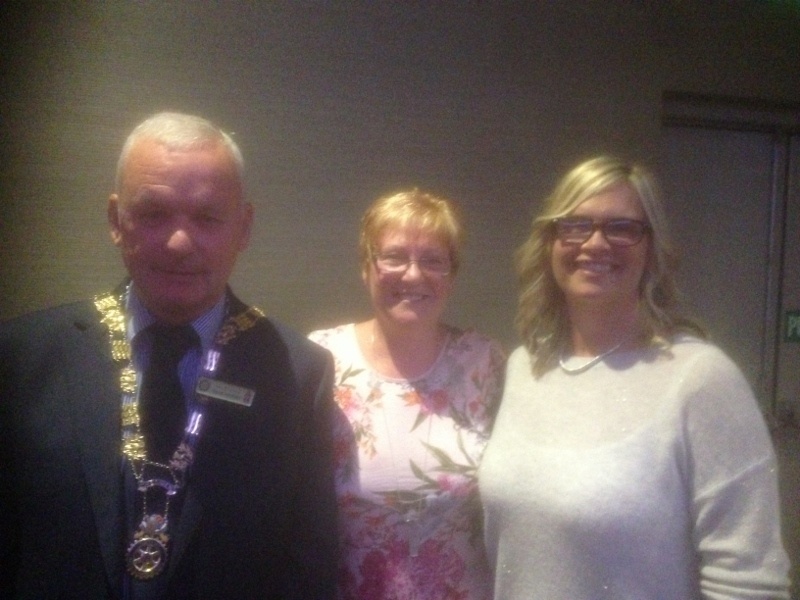 President Claire, AnneMarie and MargaretRose went to Rome to attend the Jubilee for Rotarians in St Peter's Square on April 30. Who should they meet but RI President Ravi Ravindran himself. Club members who helped out at the annual senior citizens concert. Tea and cakes were served and entertainment by Celtic Distraction made it an enjoyable event. 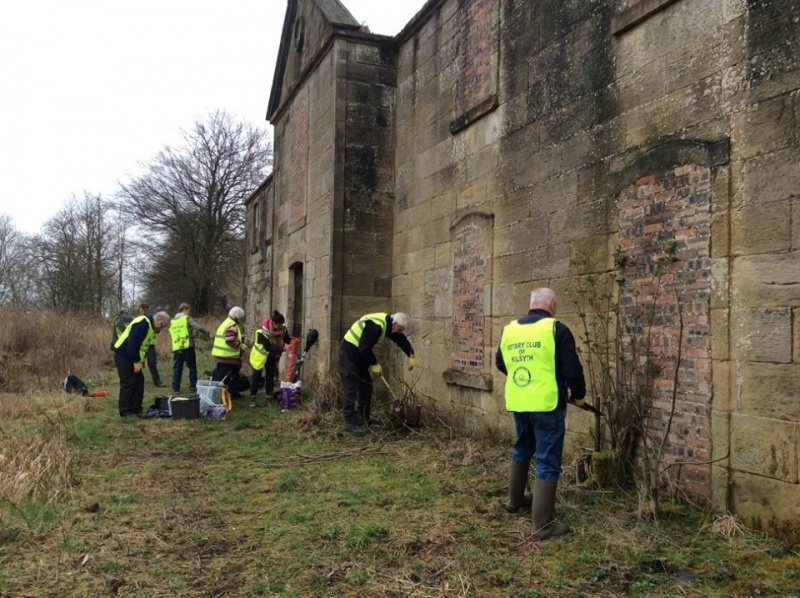 A number of Rotarians assisted volunteers with the Scottish Waterways Trust to tidy up vegetation at the Craigmarloch Stables. Pupils at St Patrick's Primary are pleased with the show of crocuses which they helped to plant to commemorate World Polio Day. 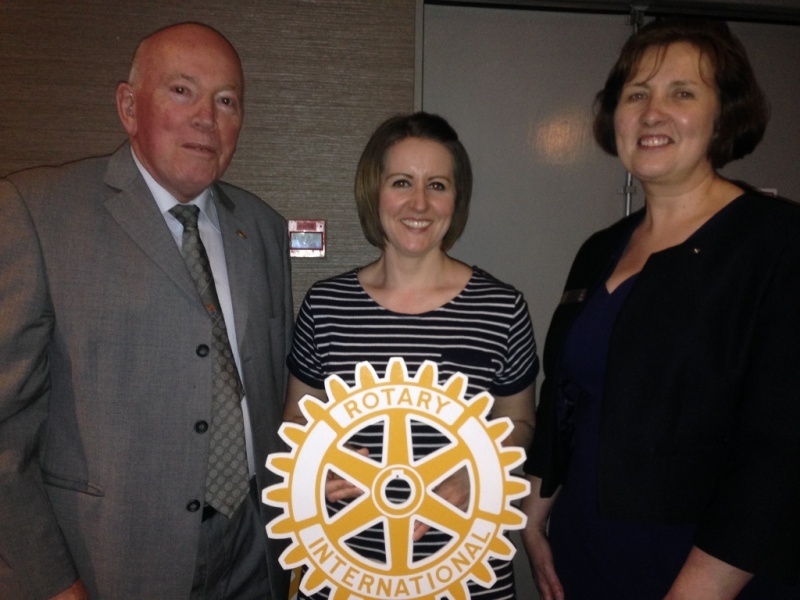 Kilsyth club has donated Â£400 this year to Rotary's End Polio Now campaign. Young Philanthropist Inititiative winners from Kilsyth Academy visited the club. 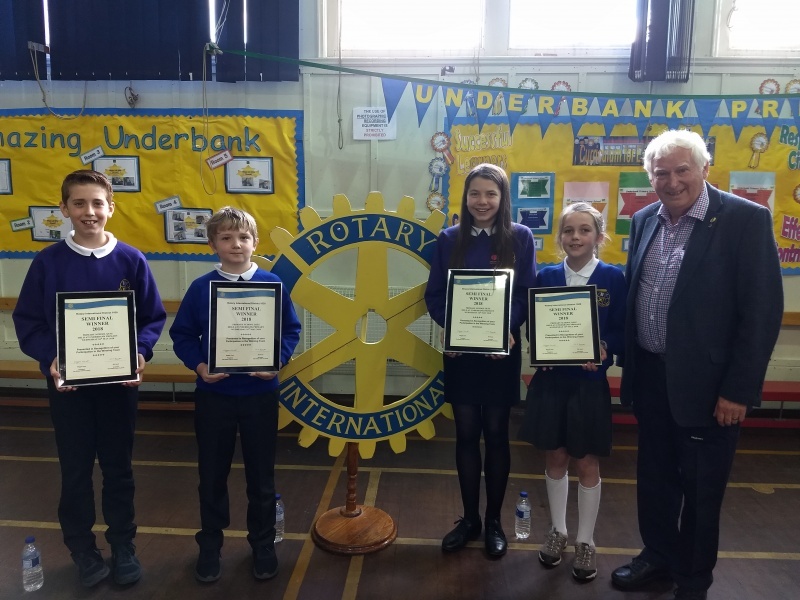 Club member Pat Docherty helped to judge the event and the Rotary club made donations to a number of charities that pupils had researched and supported. A group from the club and friends visited Polmont club and enjoyed an interesting presentation about the Kelpies. 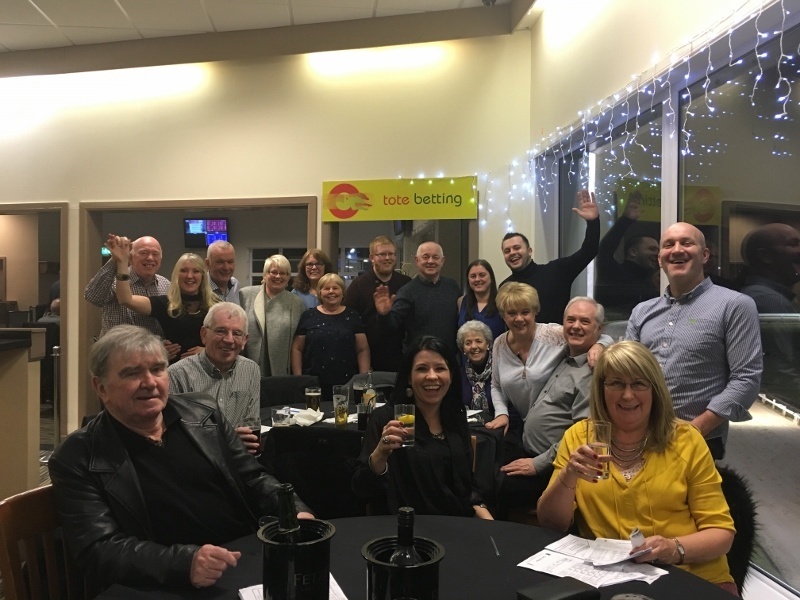 A number of Rotarians, partners and friends had a great time at Shawfield Stadium. Another enjoyable social event. 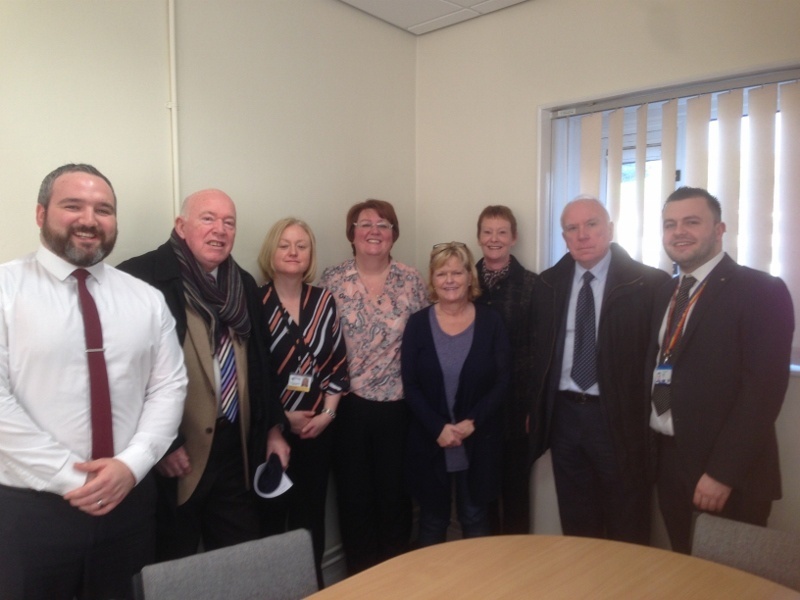 Some of the Rotarians, friends and staff at Kilsyth Academy who were involved in giving over 100 pupils in S4 the experience of being interviewed for as job. Interviewers were very impressed with the quality of the responses. Another successful Burns Night. How often does the District Governor get to meet a club President's grandmother? 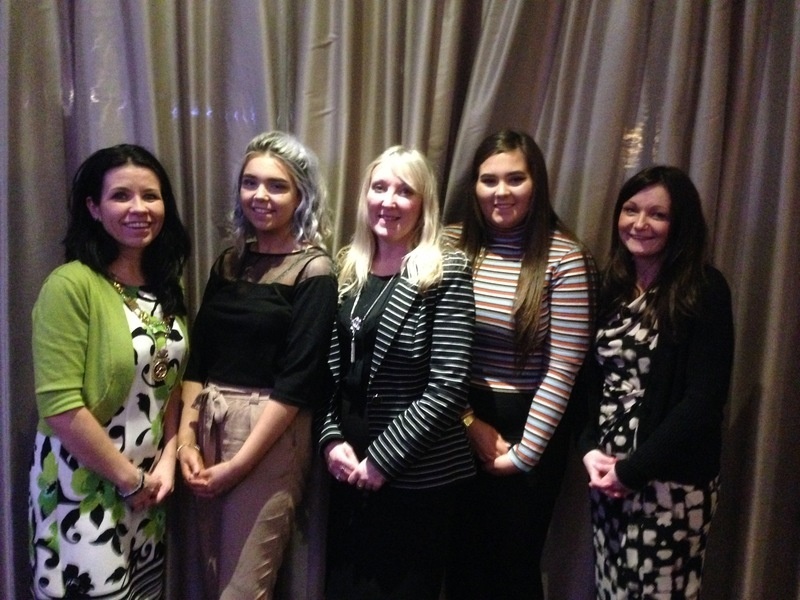 Pupils from St Maurice's HS and Kilsyth Acad gave an interesting talk at a Partners' Evening meeting about their weekend at Challenge Enterprise which Kilsyth club supported. Santa visited Cakelatier in the Main Street and handed out sweets to local children. He had lots of helpers to assist him on the day. 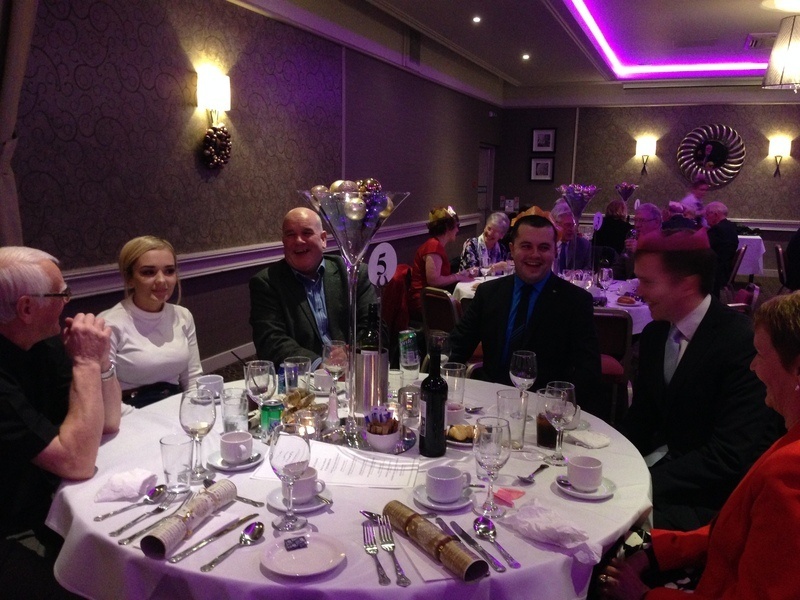 Rotarians, partners, friends and guests enjoyed their Christmas Night in the Coachaman Hotel. Local MP Stuart Macdonald was guest speaker and Richard and Henry provided the entertainment. 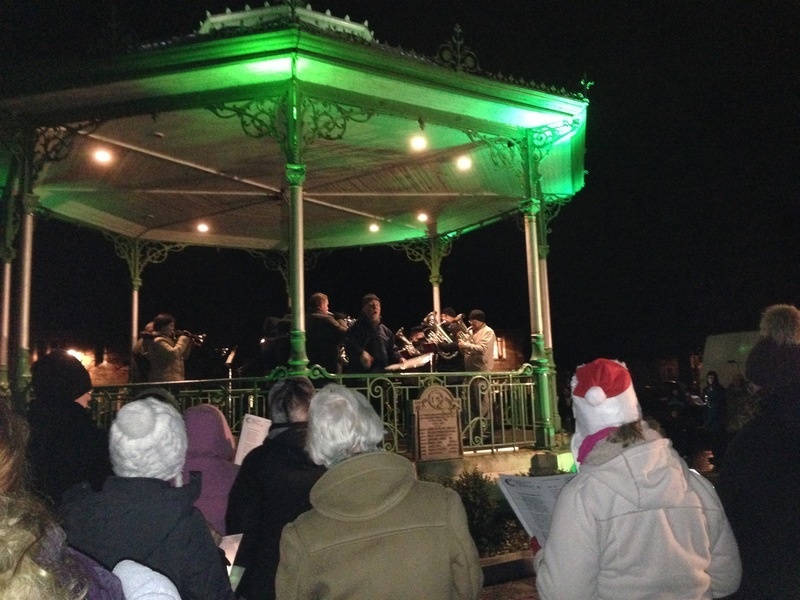 Kilsyth Club organised once again a successful annual carol service in Burngreen. Thanks are due to Croy Band for their help and Alex Graham for catering. 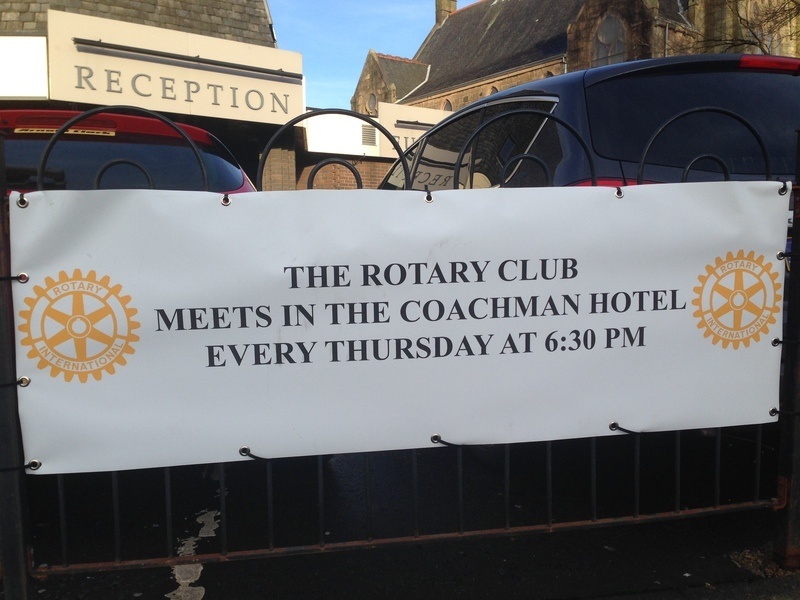 Our main fundraiser was held in the Coachman Hotel in late October. 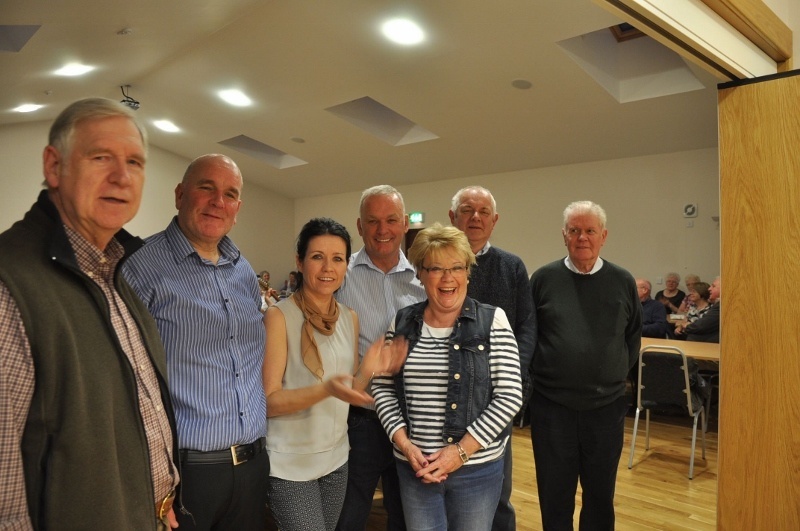 We enjoyed a meal, Irish Bingo, raffle and afterdinner speakers before an auction of a host of items. Sheriff Lindsay Wood gave a very witty speech and Frank Robb entertained with humerous observations and song. We are grateful to our sponsors, local businesses and organisations for their support. This year we raised over Â£4000. 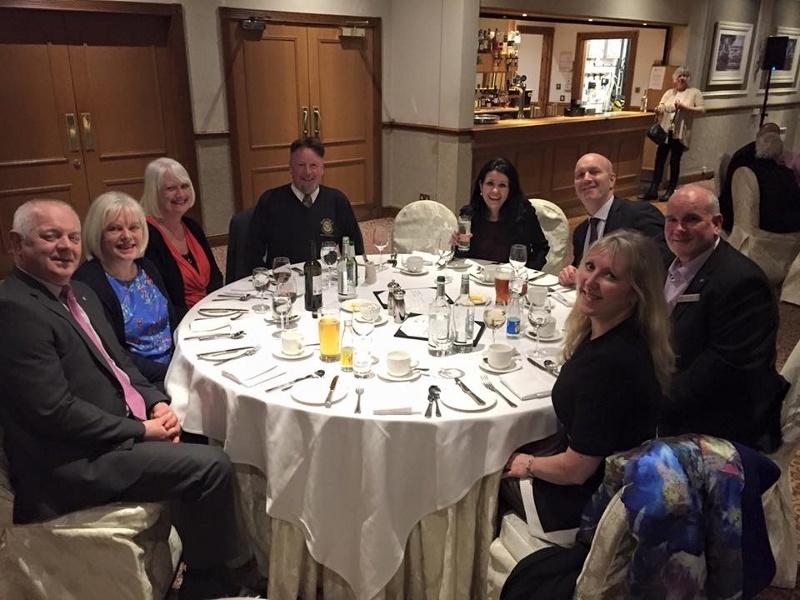 Some members and partners attended the district conference in Dundee. 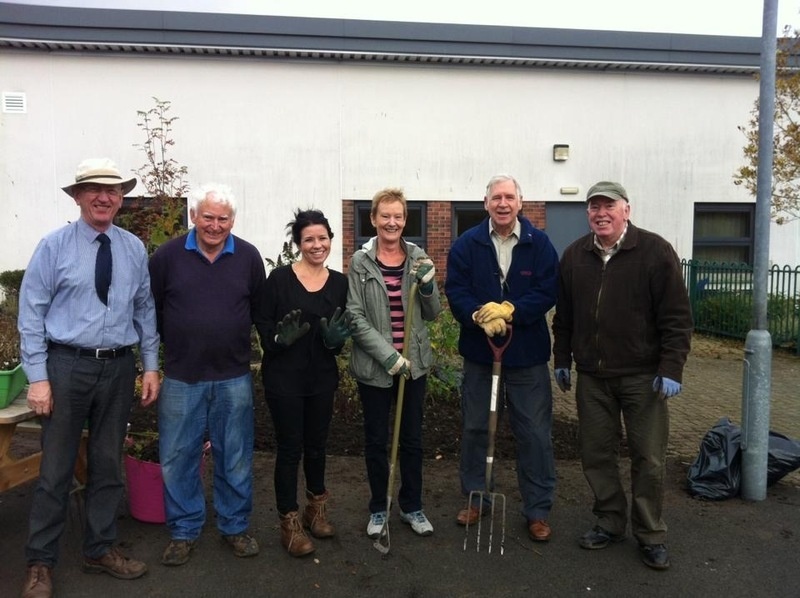 Club members preparing to plant crocuses at St Patrick's Primary School. 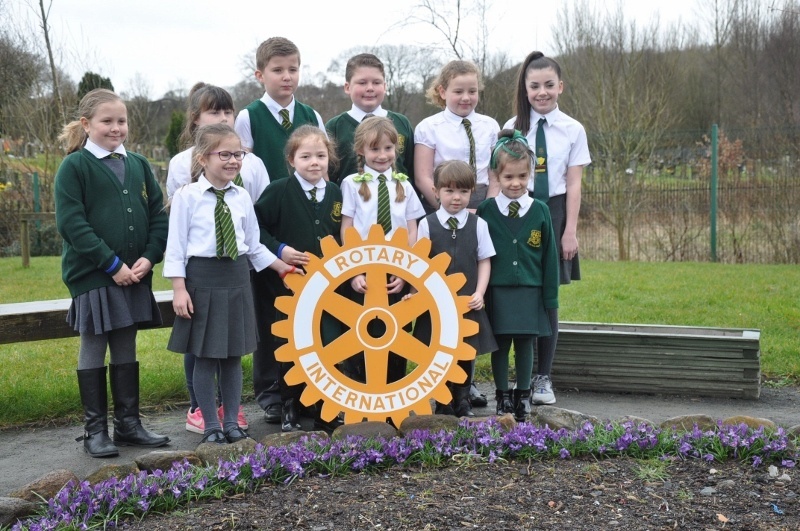 The club has been supporting crocus planting activities through working with local schools for several years and made regular donations to End Polio Now, Rotary's international campaign that has helped to almost eradicate polio. 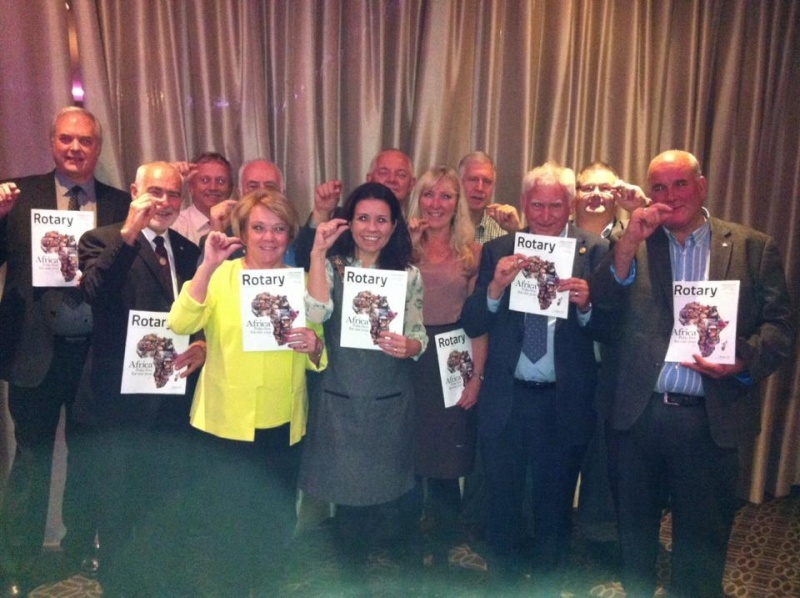 Club members are keen to show their support for Rotary's campaign to end polio - just a little bit more is needed. 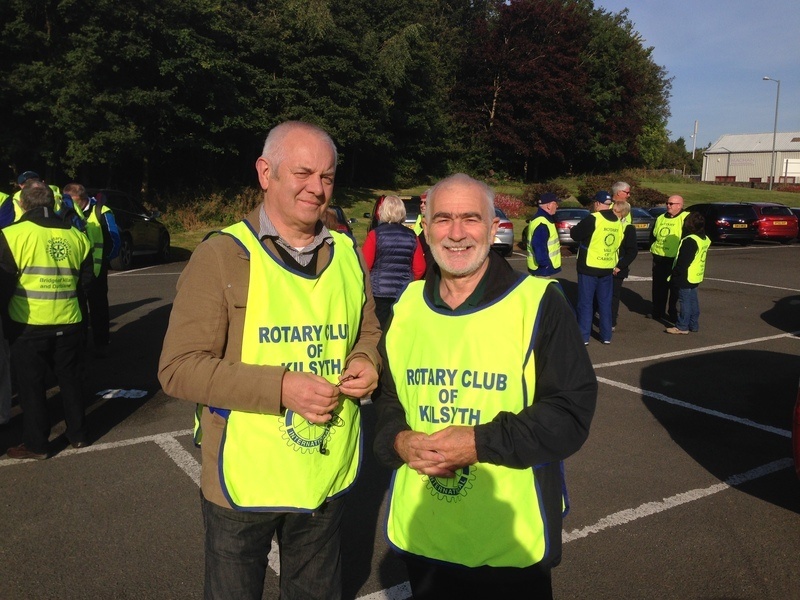 Club members helped to marshall at the annual Strathcarron 10k. The race raises thousands of pounds for the hospice. 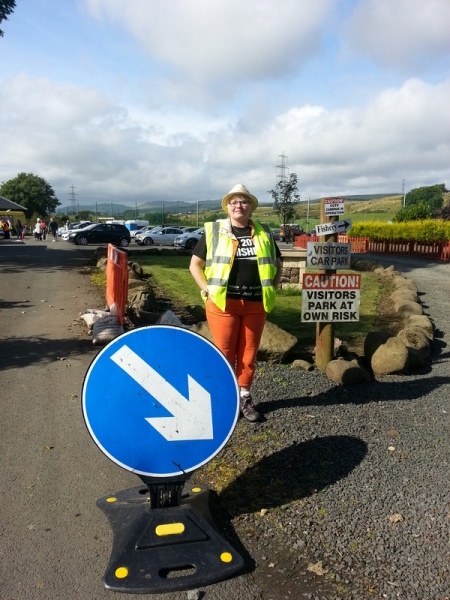 Members helped marshal at the Tough Mudder event that raised money for Strathcarron Hospice. 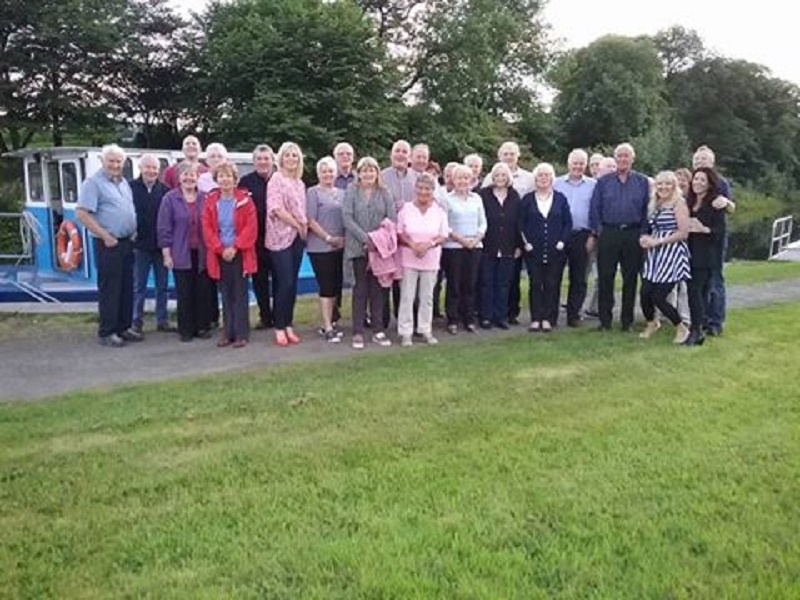 Rotarians and friends get ready for an evening cruise on the Forth Clyde Canal. 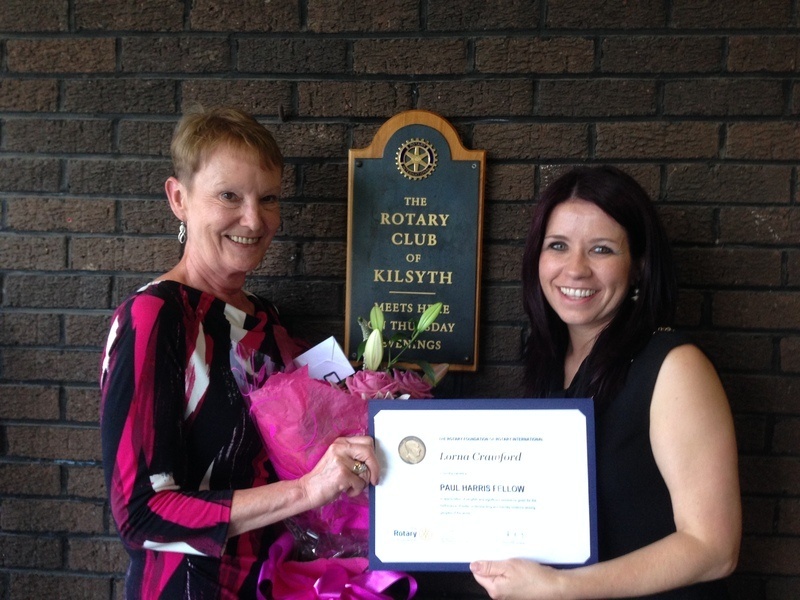 One of President Claire's first tasks was to present Rotarian Lorna Crawford with a Paul Harris Fellowship for dedication to the club and ideals of Rotary. 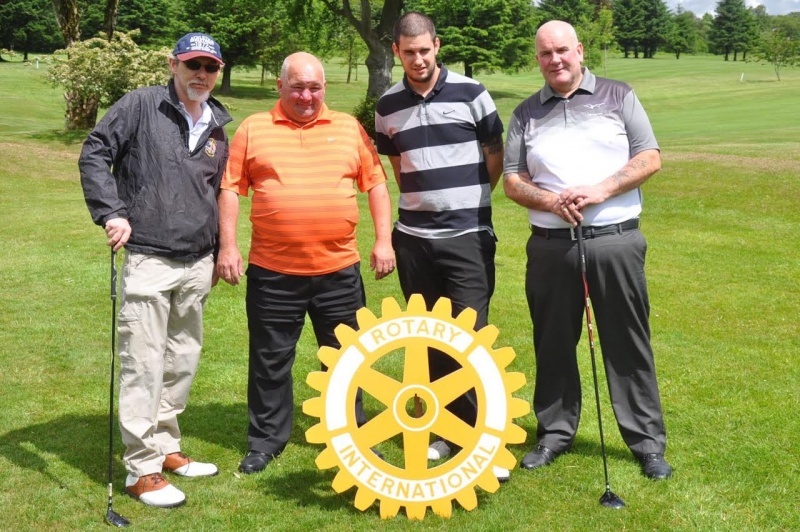 For the first time, we organised this year a charity four ball golf competition. 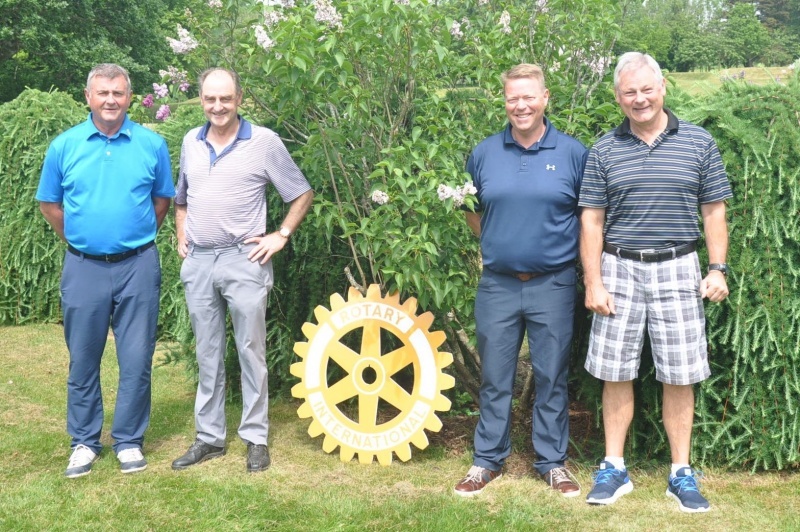 It was held at Kilsyth Golf Club which offered a great test of golfing skills and some terrific views throughout the course. Monies raised will be devoted to End Polio Now and Rotary Foundation. The date was Friday June 5, 2015. Over 20 teams took part. It raised over Â£3000. Planning is taking place for the follow-up event scheduled for next June. Senior Ciitzens enjoyed tea/coffee and home-baked biscuits and cakes at the annual concert. Excellent entertainment was provided by Celtic Distractions. This Rotary competition is gaining popularity with schools throughout the District . Headteachers are keen for their schools to take part as it embraces aspects of the curriculum for excellence in schools. 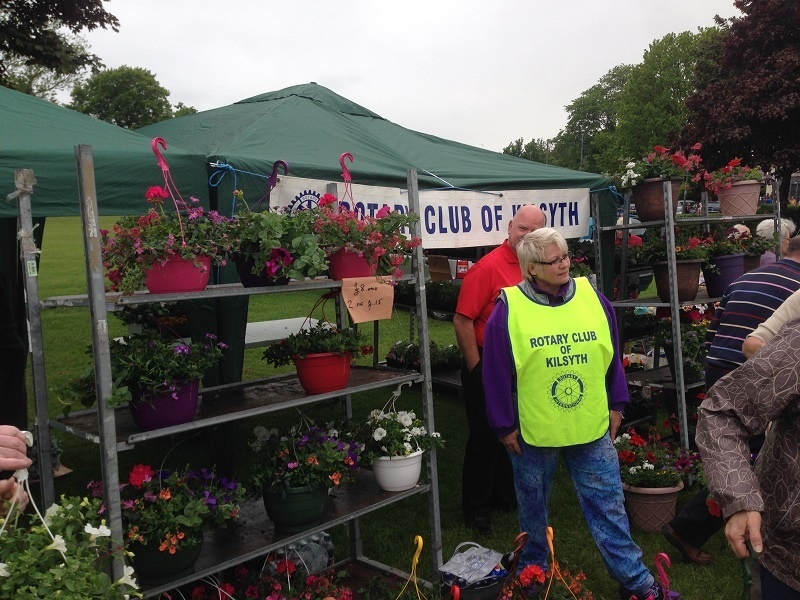 The Rotary Club of Kilsyth has, for a number of years, organised the local competition for the west Zone of district 1020. There was a record number of schools and teams this year. Our annual Burns' Night was held in the Coachman Hotel, on a Friday evening in late January. 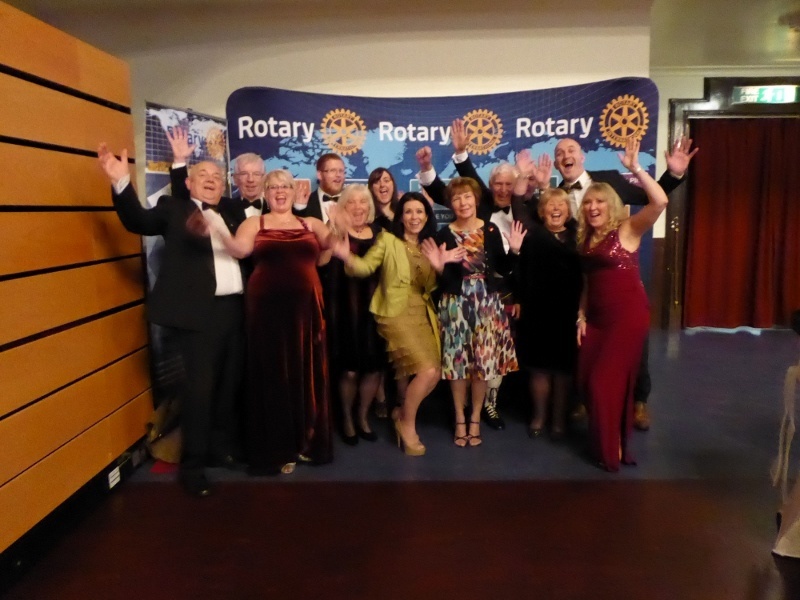 it was hugely enjoyed by Rotarians, partners and friends.